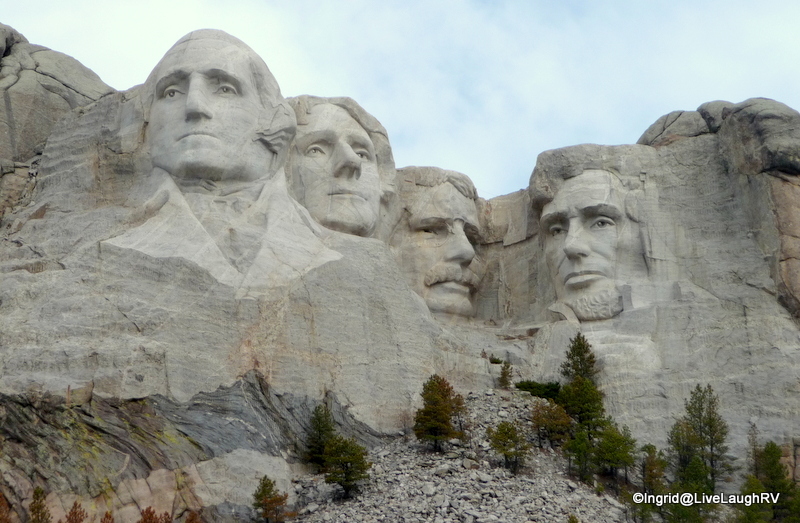 We thought a week in the Black Hills would be enough time to see all the sights that were of interest to us, and although we touched on the ones at the top of our list, we could have easily spent another week exploring. Hubby and I were both curious about the towns located at the northern end of the Black Hills: Deadwood, Sturgis, and Spearfish. 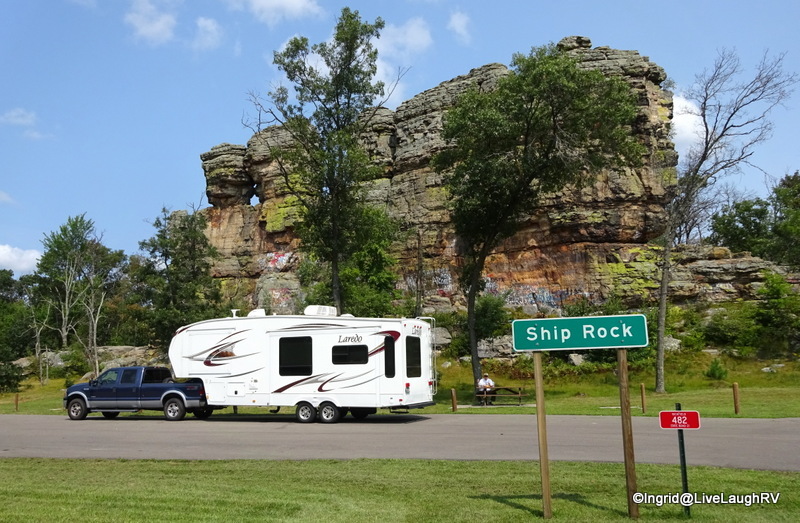 As we embarked on a scenic drive, our first stop was a quick drive through Sturgis; famed for the Sturgis Motorcycle Rally. Not our thing, but we were curious. I’m sure this place can get really crazy during the cycle rally. During our excursion, it appeared to be just another small town with a twist; businesses geared toward motorcycles. 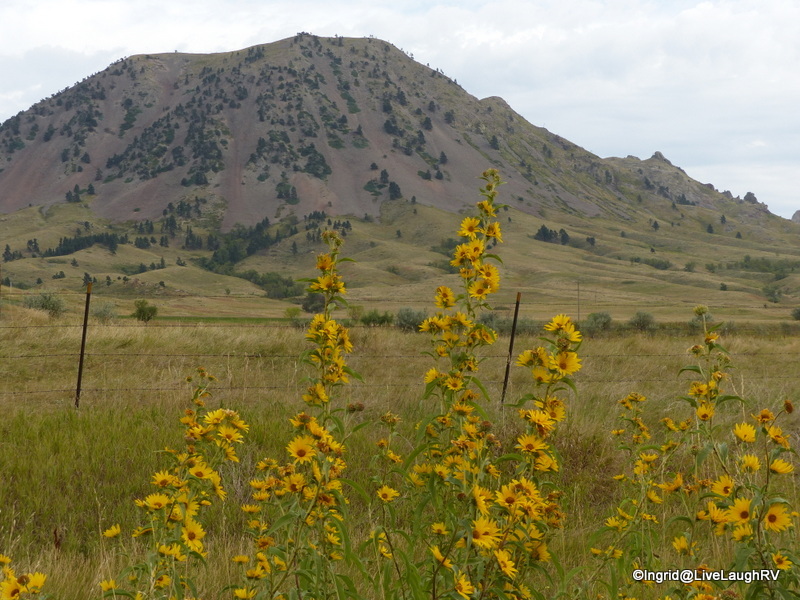 While in the area, we checked out Bear Butte State Park and its sacred mountain. 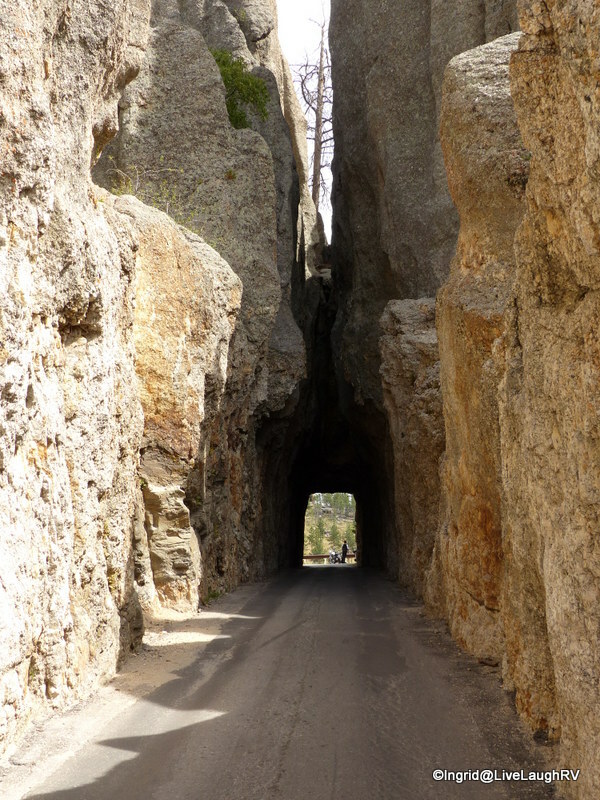 It was then on to Spearfish where we took the Spearfish Canyon National Scenic Byway. 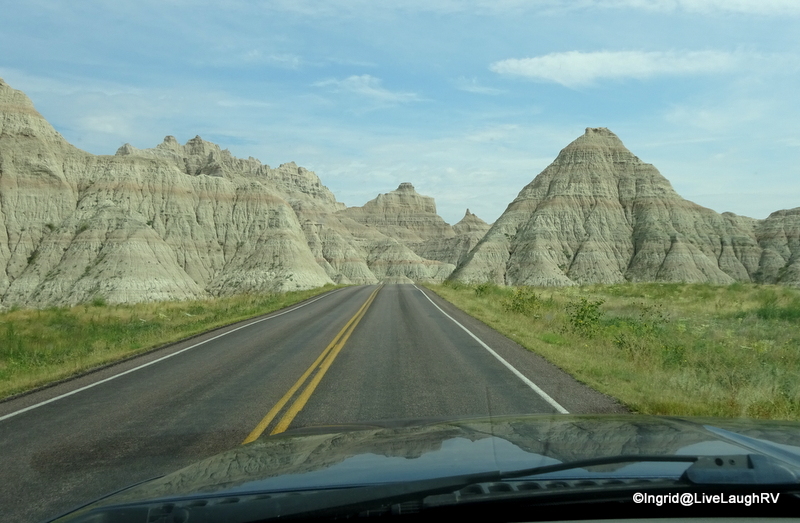 Twisting and turning through towering limestone cliffs, along mountain streams and waterfalls, the drive was reminiscent of Boulder Canyon in Colorado and very pretty. We didn’t stop much for photos as our bellies were growling which kept us focused on rolling. We arrived in Deadwood, South Dakota, just in time for lunch. Hubby and I were really curious about Deadwood and this was the focus of todays drive. 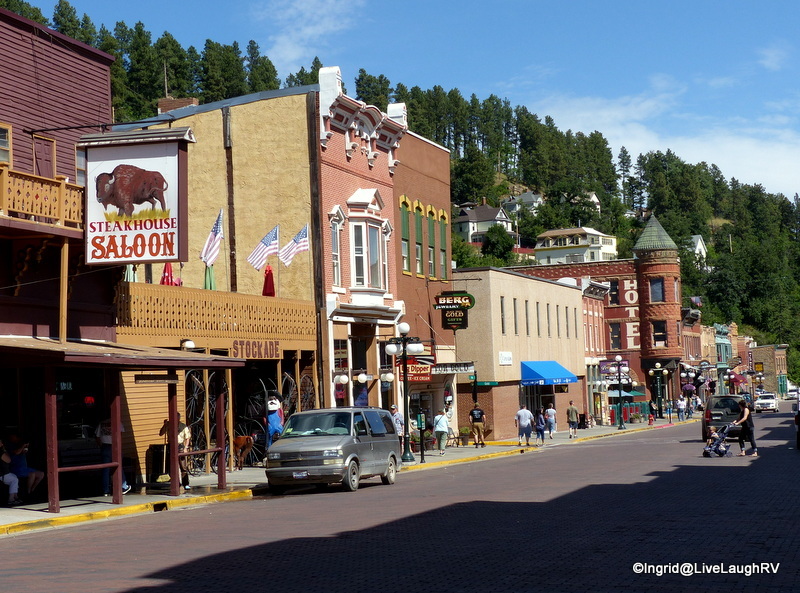 We’ve watched the complete series of the HBO production Deadwood ….. a couple of times, which was the catalyst that piqued our interest in laying eyes on this historic town. The series tried to stay true to history with a little Hollywood thrown in for amusement. We ate lunch at Diamond Lil’s located inside the Midnight Star Casino and owned by Kevin Costner. The place is adorned with costumes from Kevin Costner films. Even Whitney Houston’s costume from “Body Guard” was hanging in the place. The wall décor provided a level of entertainment. 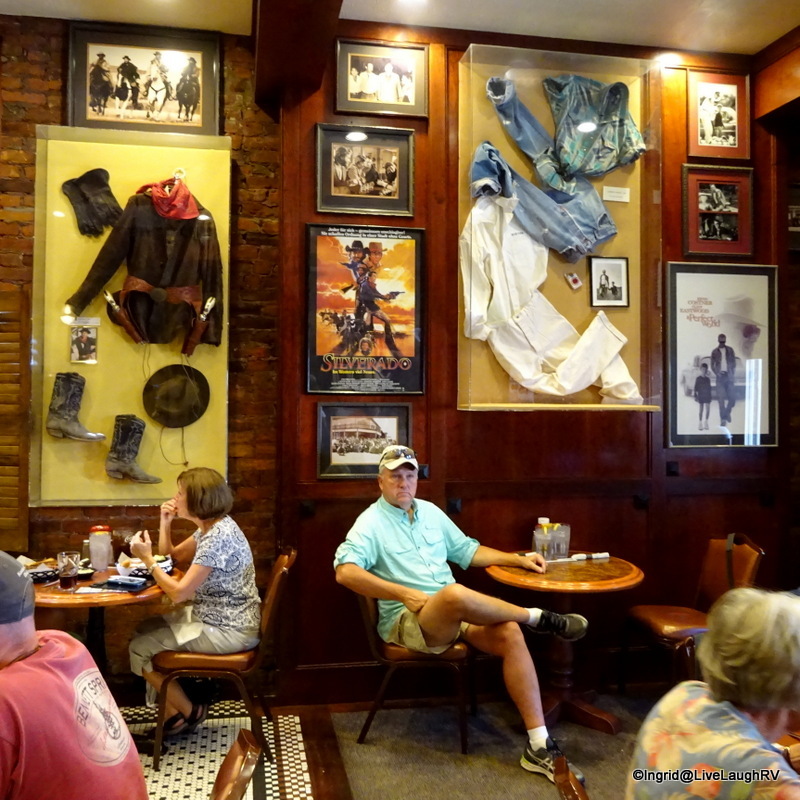 The food at Diamond Lil’s was average, but the walls decorated with movie costumes made it interesting. Gaming in little casinos, average food, tourist attractions playing off of the Wild Bill Hickok days, and plenty of cigarette smoke sums up my take on Deadwood. I can check Deadwood off my list with no compulsion to revisit! 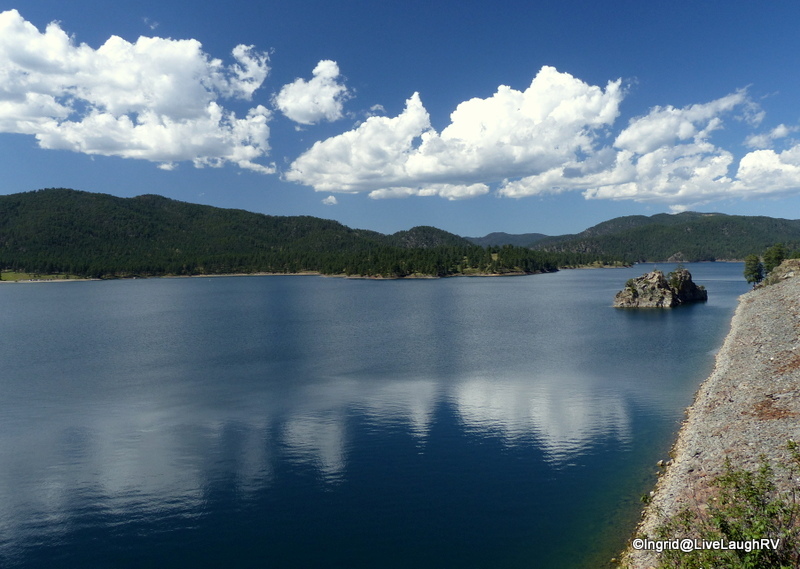 On our way back to Rapid City, we stopped by Pactola Reservoir and fell in love with this picturesque lake. It reminded us of the many lakes we enjoyed paddling in the Boundary Waters Canoe Area in northern Minnesota; surrounded by granite rock and pine trees….. pristine and beautiful. 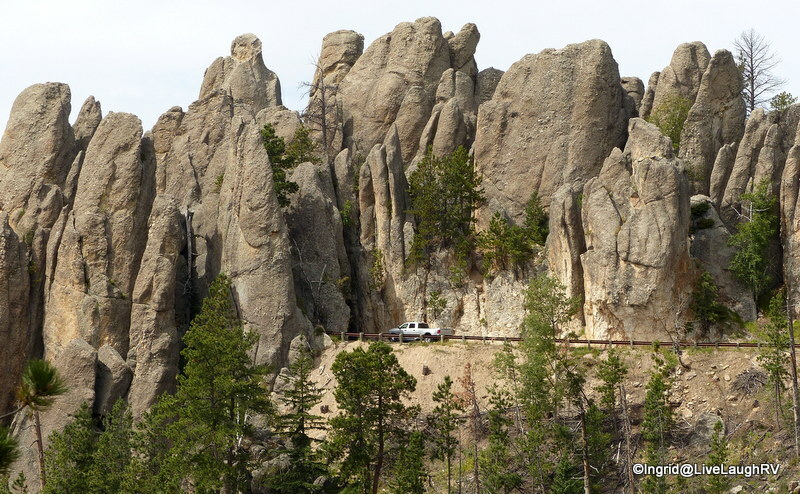 The next day found us returning to Custer State Park and meandering some of the scenic byways around this part of the Black Hills…. again! 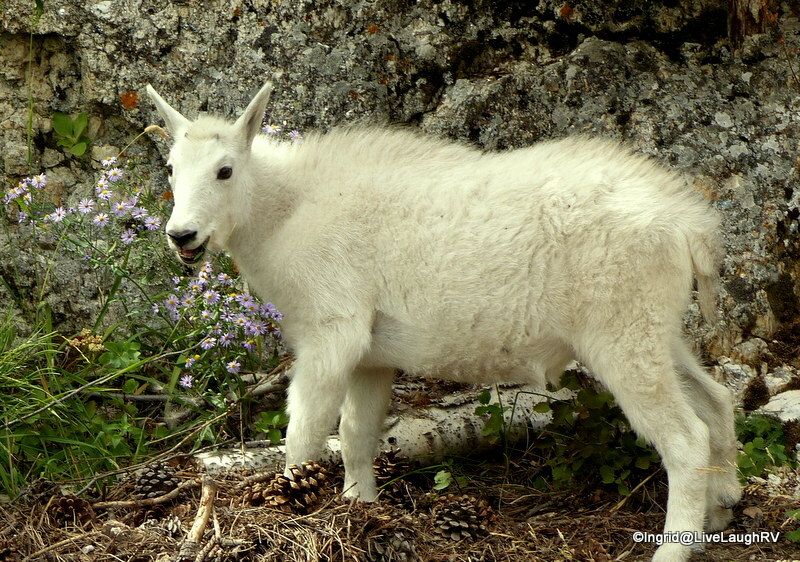 Is there anything better than coming across wildlife when you least expect it? 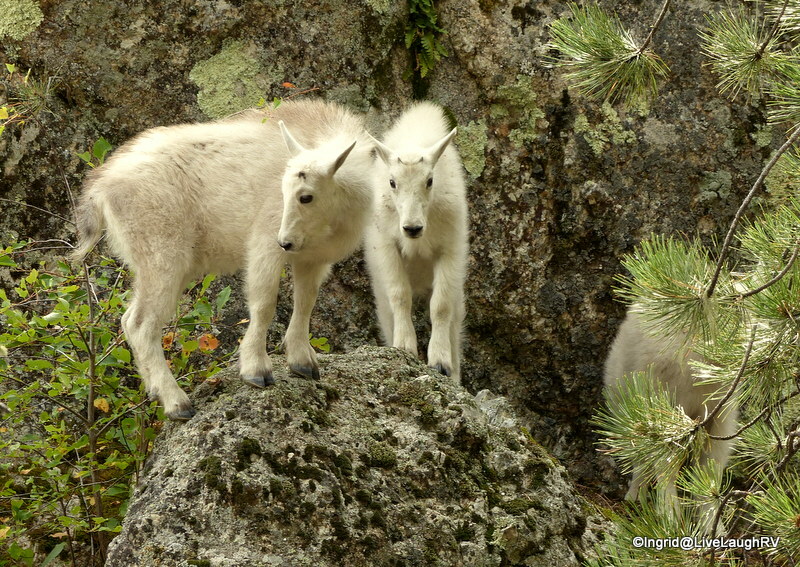 How cute are these mountain goats? Wildlife is the best! “I know, I’m cute, but you can’t take me home”! I could’ve sat there watching these agile hikers for hours, but lunch was calling. 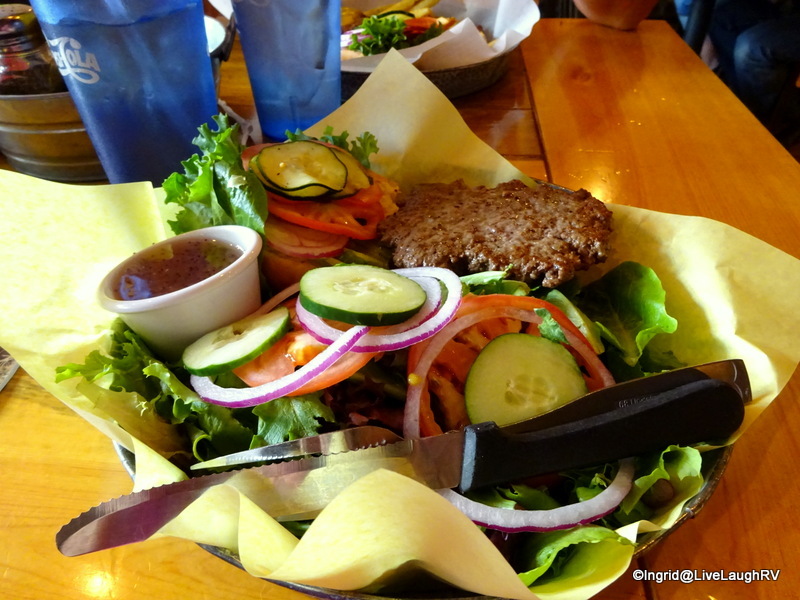 We’d heard from a couple of bloggers that the Black Hills Burger & Bun was the place to have lunch in the town of Custer, and boy, it did NOT disappoint. The food was delicious and we wanted to go back on another day before we left town, but they closed for a few days for some much-needed time off. They grind their own meat daily and everything was very fresh. Hubby had the bison burger while I enjoyed Angus. 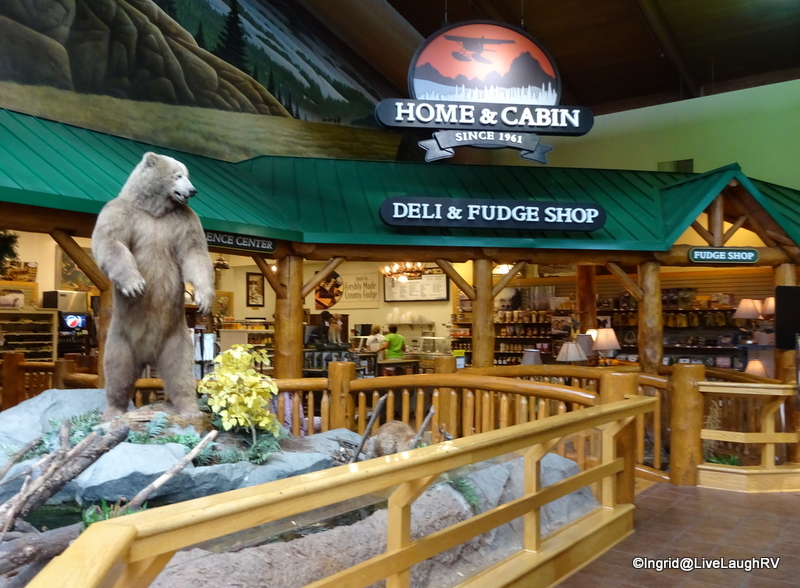 Seriously, for anyone looking for a great meal while visiting the Black Hills, this is the place to go. FYI – it is a busy place, for obvious reasons. 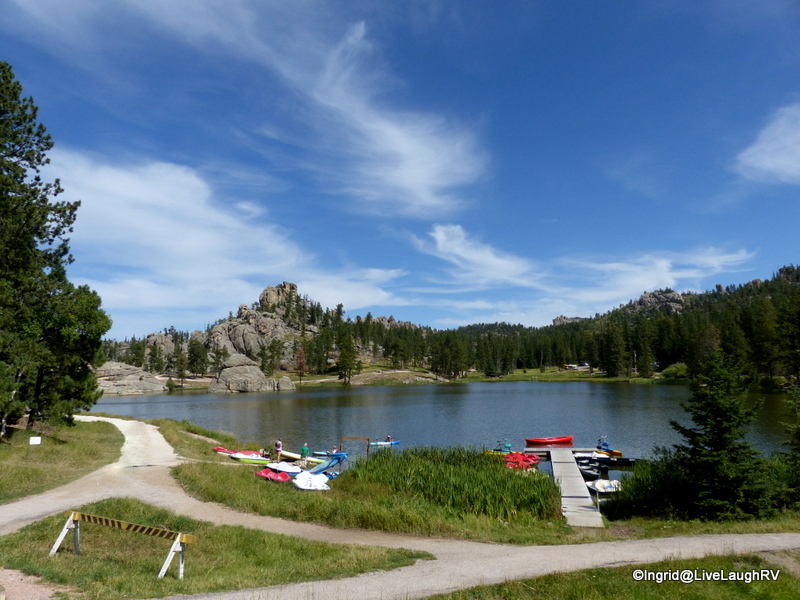 Our last day in the Black Hills had me longing to go back to Sylvan Lake just one more time. We met fellow blogger, Lenore, and her beautiful Golden Retriever, Honey, for a stroll around the lake and a picnic lunch. We had a lovely visit and the weather was perfect. 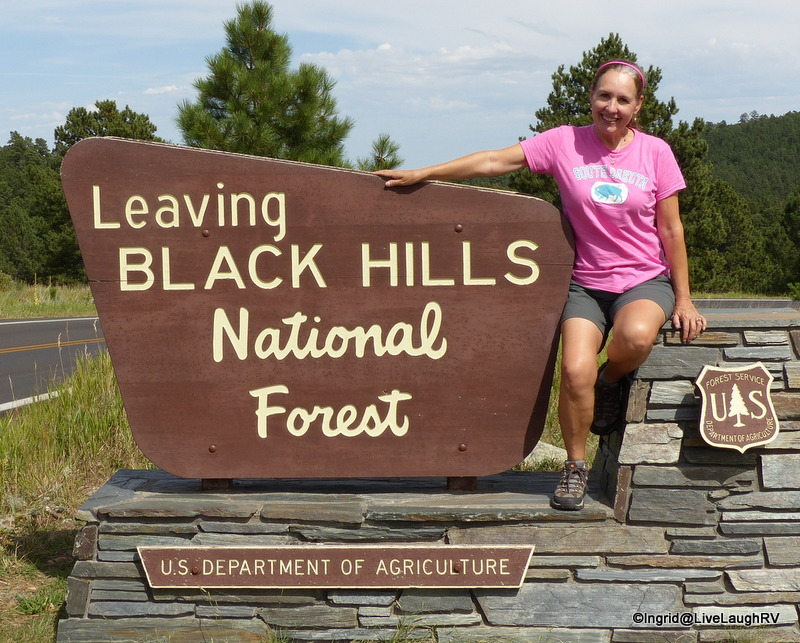 Our time in South Dakota’s Black Hills went by way too fast. I know we’ll need to return for further explorations. 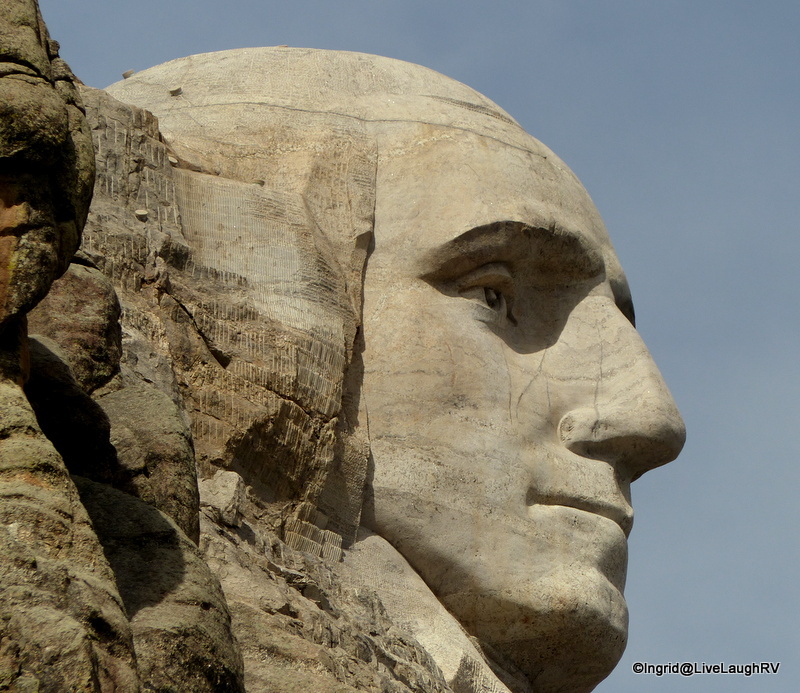 Be sure and stroll this memorial leisurely and take in some of the displays sharing the model and the history of this spectacular sculpture. 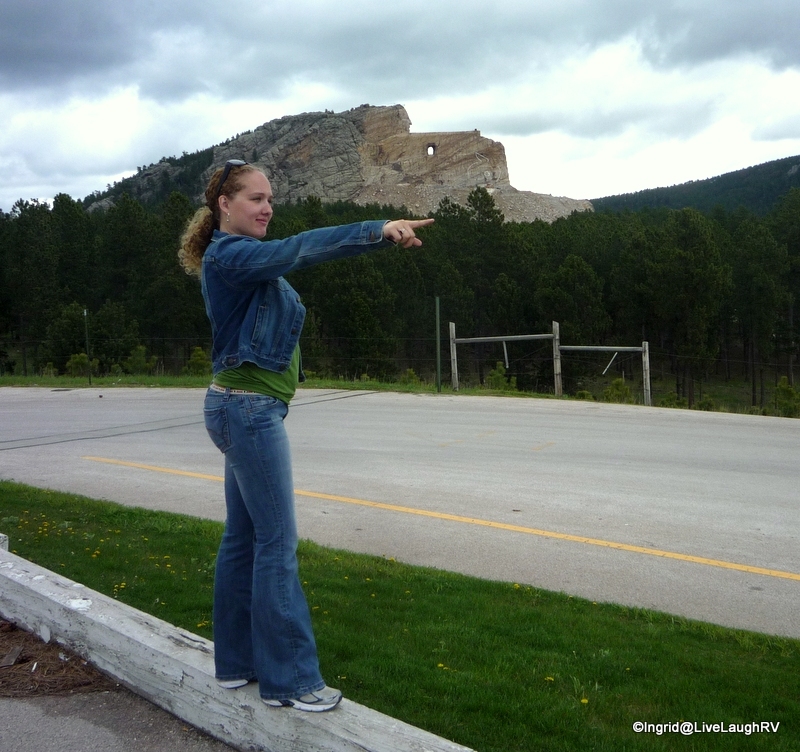 Crazy Horse is another monument not to be missed. Once complete, this sculpture will be the largest mountain carving in the world. And then there’s the fabulous hiking in the area. When Ashton and I visited, my hiking abilities at the time consisted of the necessary walking required in a super Wal-Mart or Mall. I was twenty pounds heavier than I am now and called a workaholic by my children. The thought of hiking a 7 mile round trip trail with something like a 1,000 foot plus elevation gain was beyond my thoughts….. AND abilities. 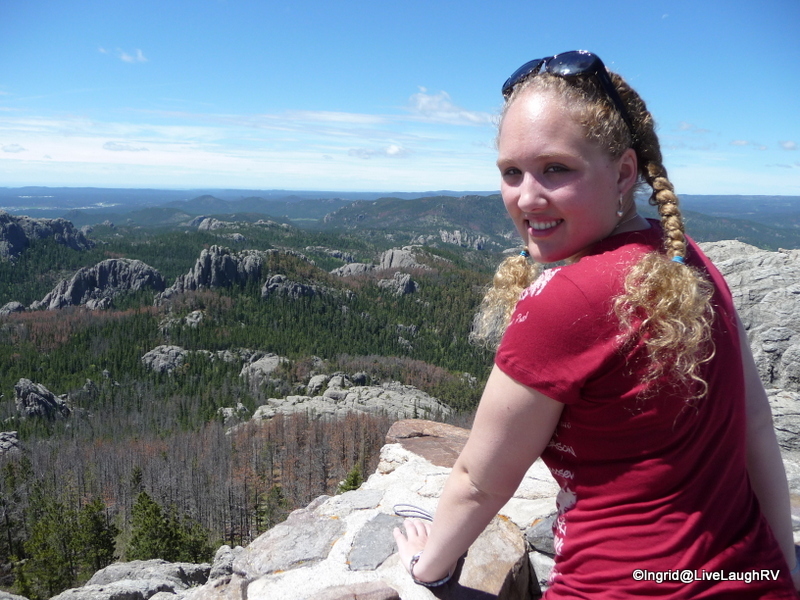 Ashton and I started our Harney Peak hike via the less popular trailhead off Needles Highway and quickly took a wrong turn which lead to us enjoying the view of the Cathedral Spires before retracing our steps and taking the correct turn. This of course added a little distance and a few chuckles to the day. The hike took us about 4 hours, which included some hanging around time at the top. Upon our return to the trailhead, I was exhausted, but felt incredibly alive. I hadn’t felt that way in years and I credit this hike with sparking the hiking bug within me. Even though I was so sore and moaned with each step taken the following day, I looked forward to embarking on my next hike. 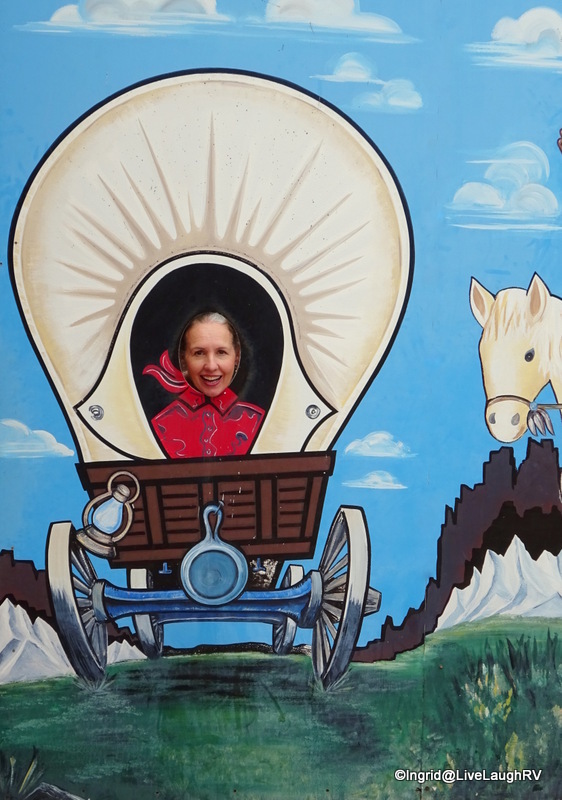 So that about wraps up our time in the Black Hills. Next up, we move down into Nebraska. September 18, 2015 by Ingrid62 Comments on Skilled, Adventurous, or Crazy? My reminiscing didn’t end in the Badlands. 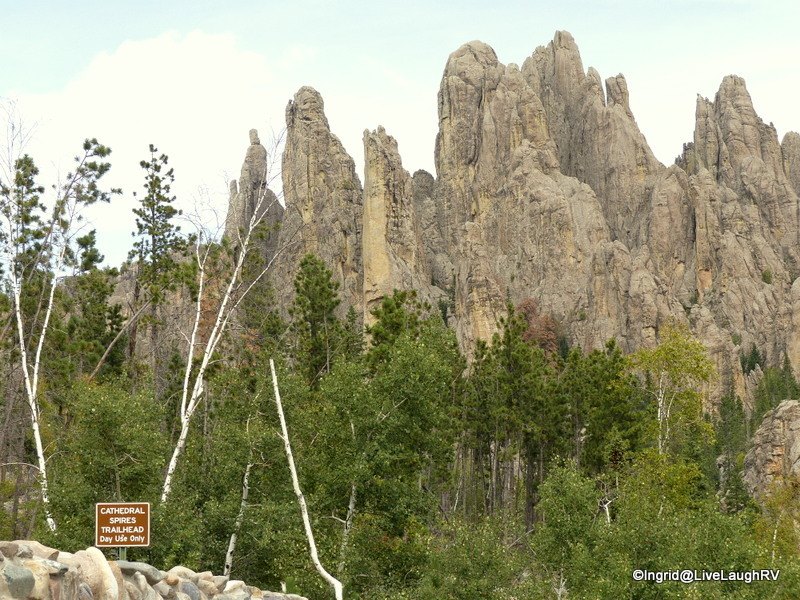 The memories continued as Al and I moved on to South Dakota’s Black Hills and Custer State Park. 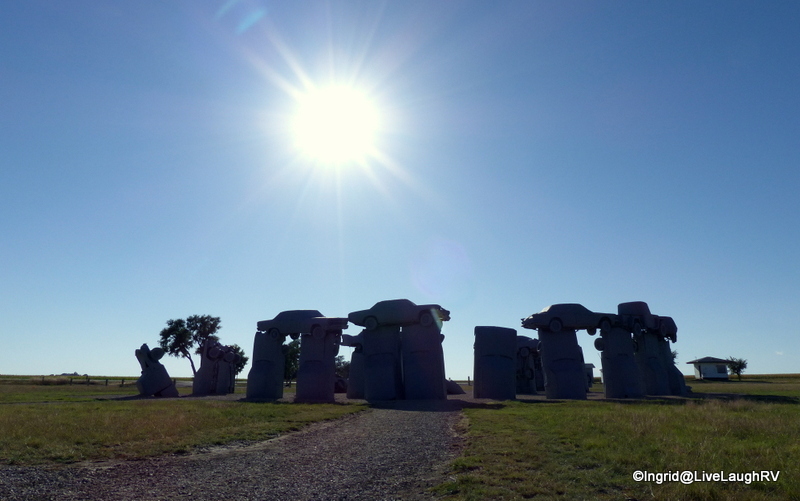 Not only did my childhood family of five visit this area umpteen years ago in dad’s new Motorhome, but four years ago my daughter and I visited during a gals road trip. Ashton was in college at the time and enjoying a break before heading off to Sydney, Australia, for a semester abroad. 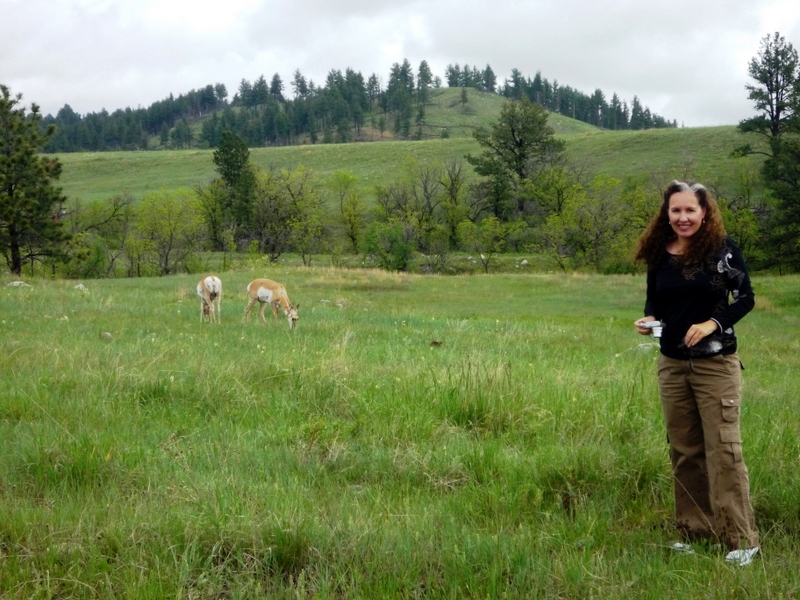 She and I hopped in my little red Toyota Tacoma and made the five-hour drive from Fort Collins, Colorado to Custer, South Dakota. 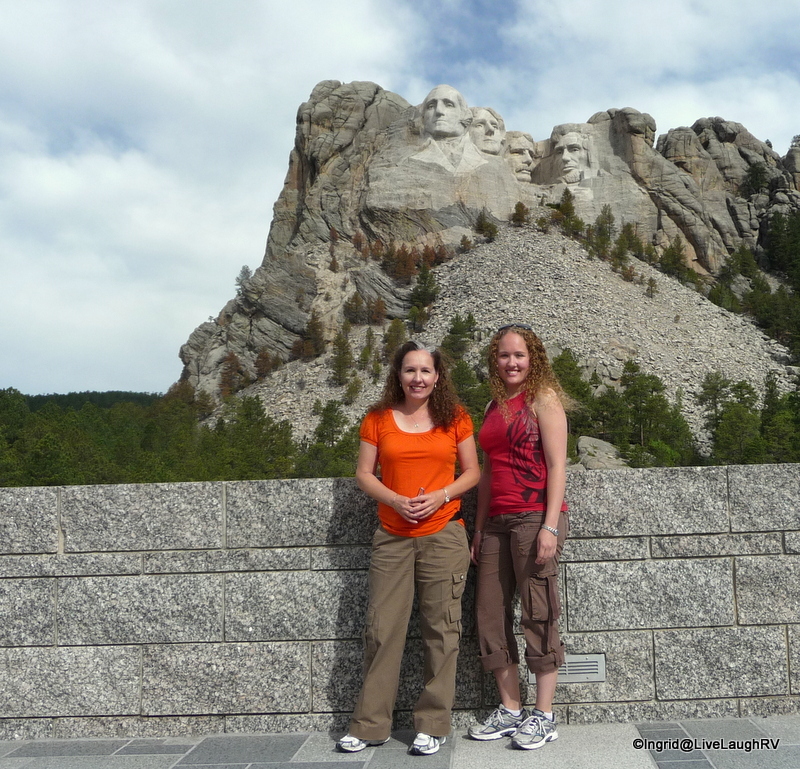 Ashton and I had such a fabulous time during that visit that I couldn’t wait to return to the Black Hills someday. And return I did in early September……… with hubby in tow this time. The three-day Labor Day weekend was nearing and since we were traveling via Plan B, without reservations, we had concerns about a place to stay. 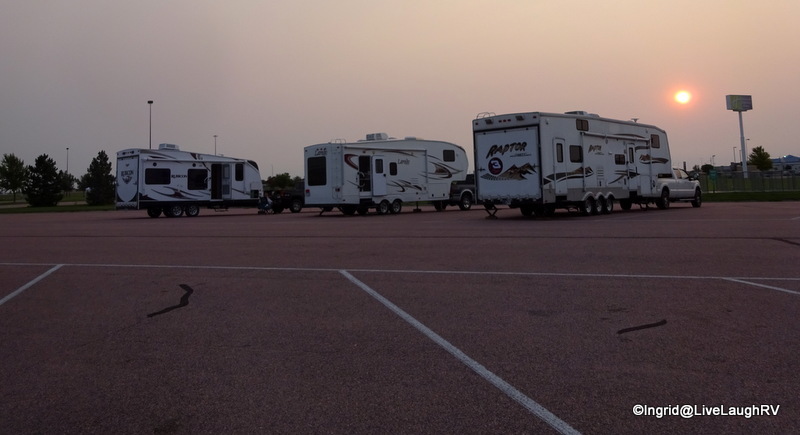 After an exhaustive search, we ended up finding a place to park at the Elks Lodge in Rapid City. 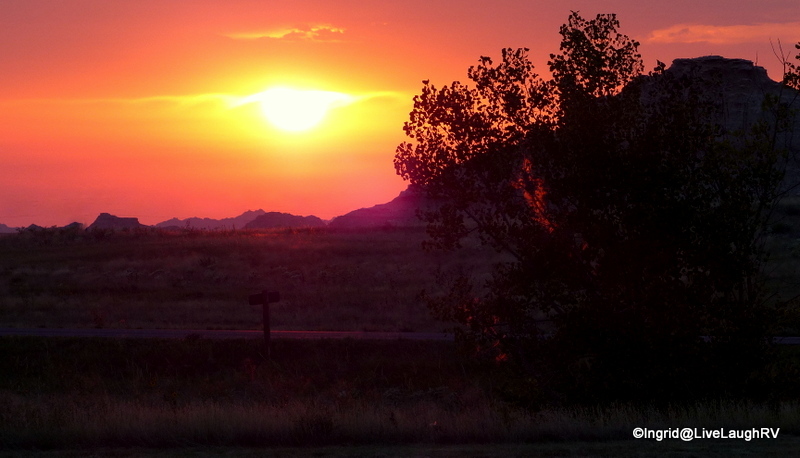 The lodge offers ten RV sites on a first come, first serve basis and had an open spot for us. It wasn’t the picturesque setting I usually crave, but the lodge was really nice and even located on a golf course. 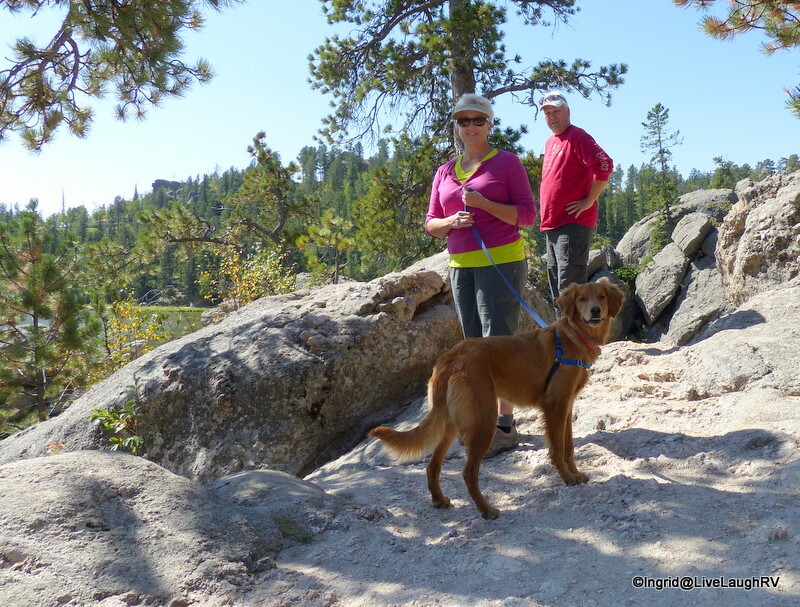 With the RV parked, Al and I ventured off exploring Custer State Park. 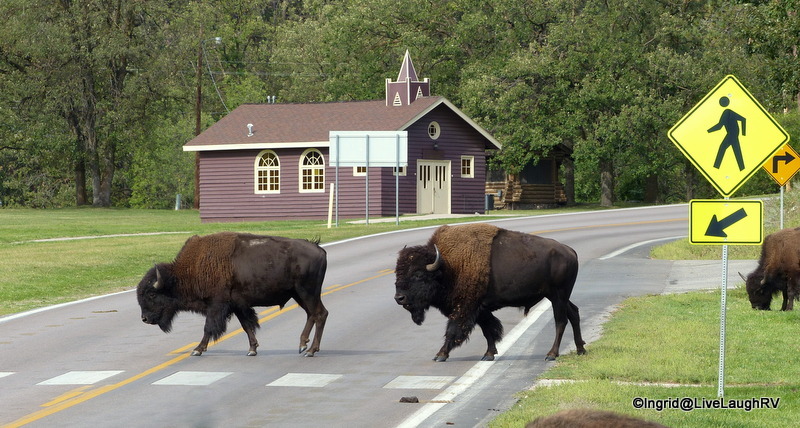 Shortly after entering the state park, we needed to stop for pedestrians bison in the cross walk…. smart guys, huh! 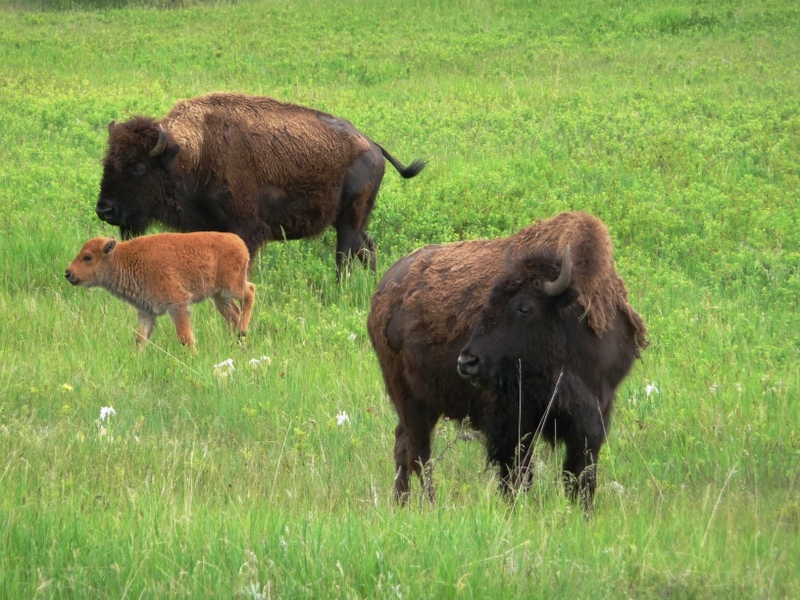 A managed herd of about 1,300 bison roam freely throughout Custer State Park. 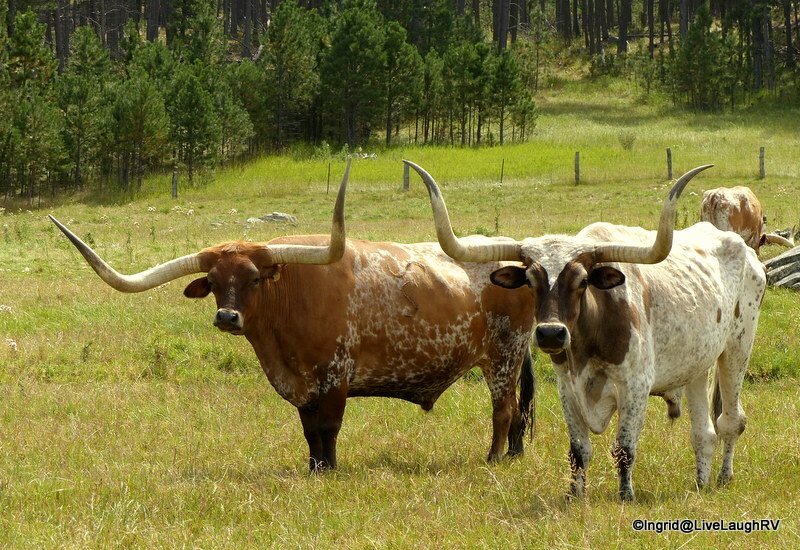 The herd is one of the largest publically owned herds in the world. 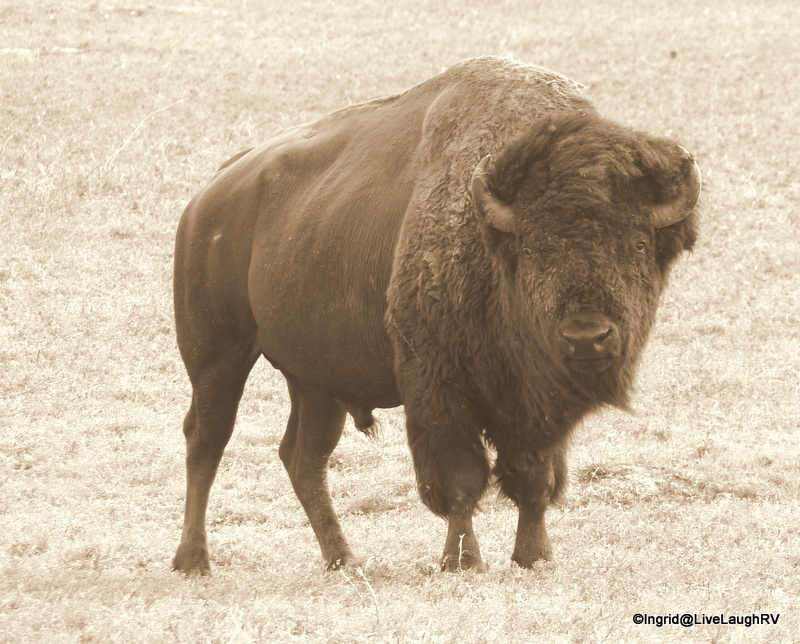 Bison are huge and can weigh as much as 2,000 pounds (907 kilograms). 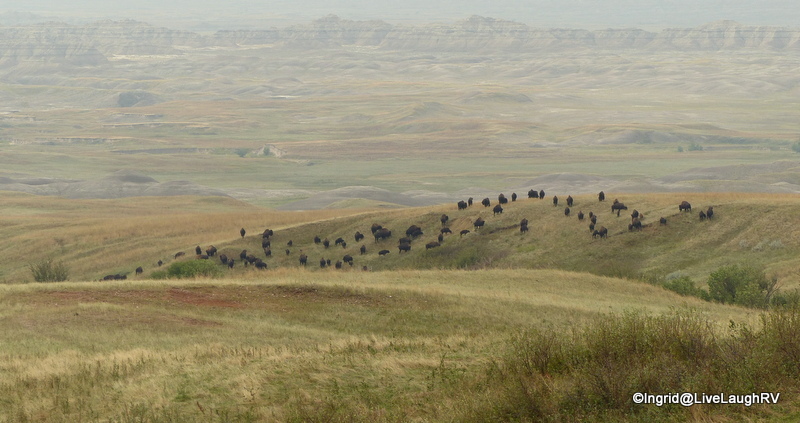 During the third week of September the park holds a Buffalo Roundup. This is an event I’d love to attend someday. 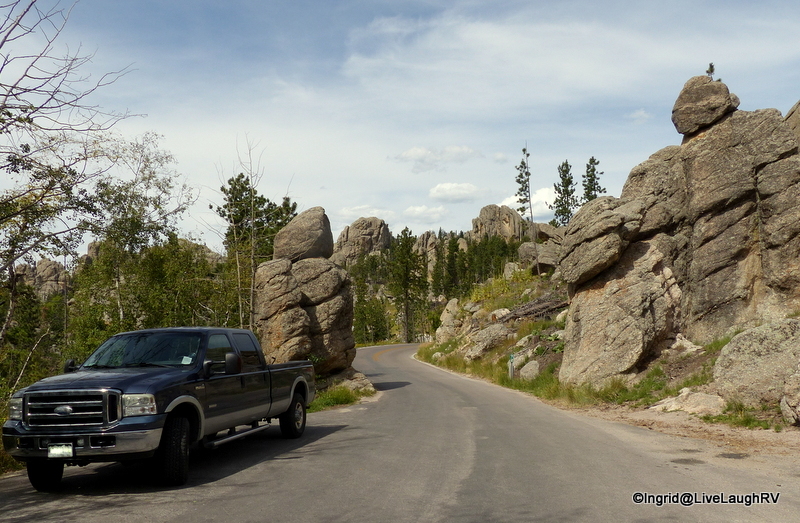 During this recent visit, we spent a great deal of time in the truck taking in the sights by driving the scenic byways. 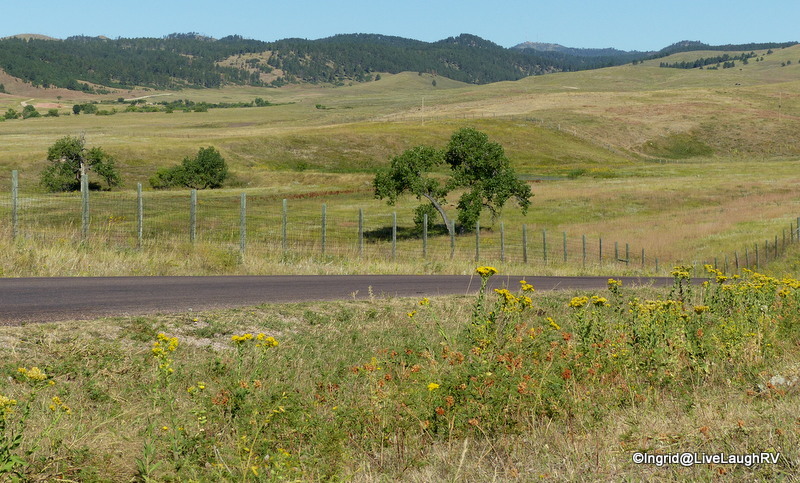 The first was the 18 mile Wildlife Loop Road that twists and turns through rolling prairie and ponderosa pines. 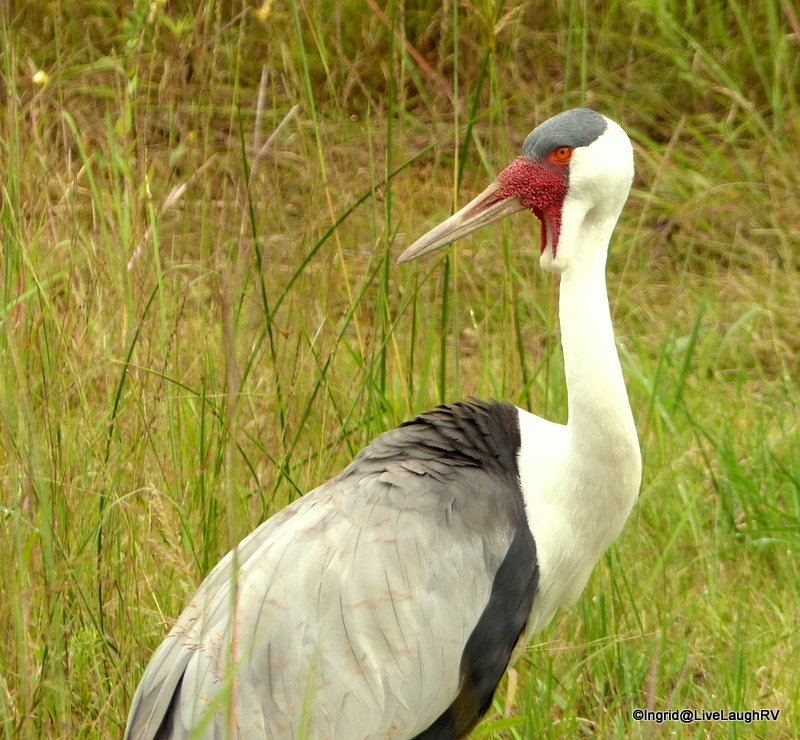 As the name implies, we saw plenty of wildlife on this scenic loop during this visit as well as previous visits. 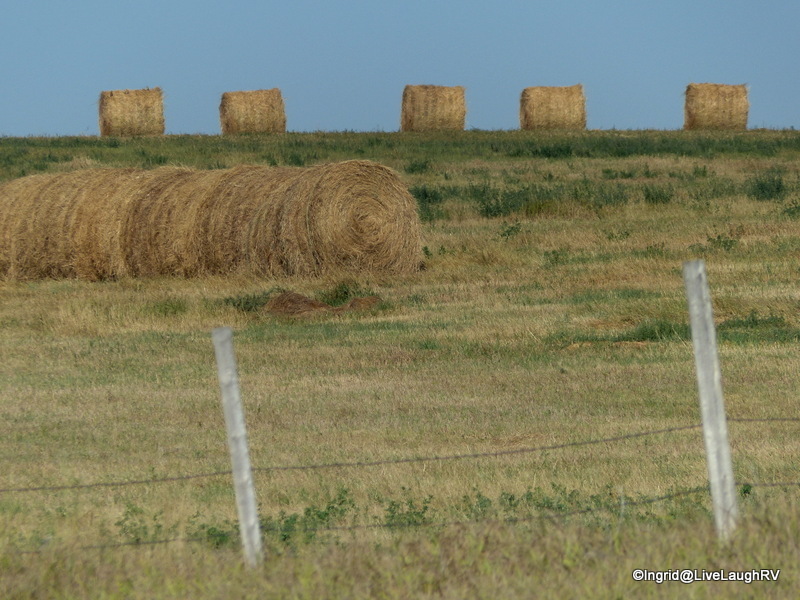 From buffalo….. to Pronghorn, and prairie dogs, to free-loading burros. You know how you’re never suppose to approach wildlife or feed them? Well such is not the case with these entertaining burros. It’s ok to bring them goodies. Keep it healthy though. I forgot to bring the bag of carrots that I purchased especially for these guys. Once this burro realized I had no treats to offer, he was on to the next car. Unlike other wildlife, the burros hang around one particular area in Custer State Park and a ranger at the visitor center is more than happy to brief you on that location and the do’s and don’ts. 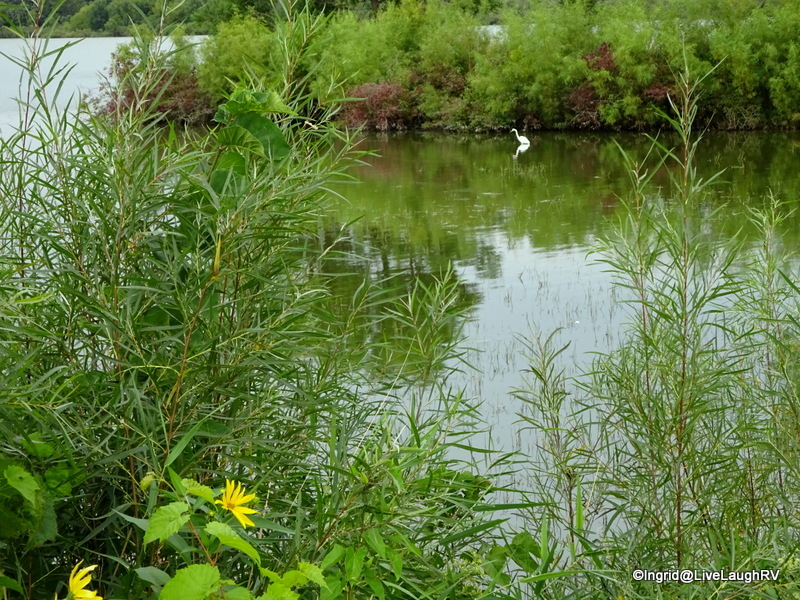 After our successful wildlife viewing, we stopped at Stockade Lake for a picnic lunch. 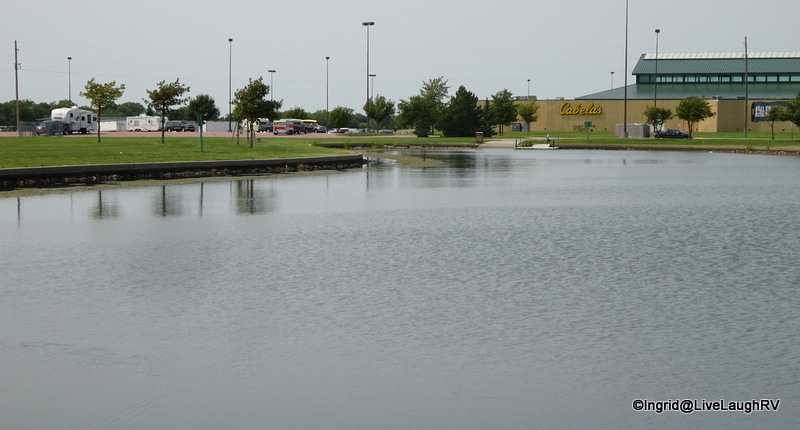 It’s a beautiful lake that allows boating and has a wooded campground. 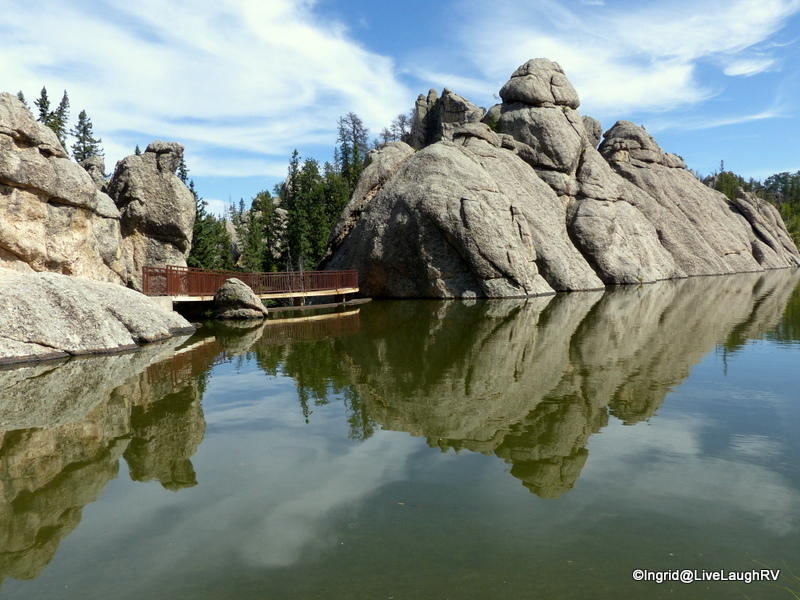 As pristine as Stockade Lake was I couldn’t wait to show hubby Sylvan Lake. As a fourteen year old gal from Illinois, I thought Sylvan Lake was the most beautiful place that I had ever seen. My brother and I hiked and explored all around this little mountain lake. 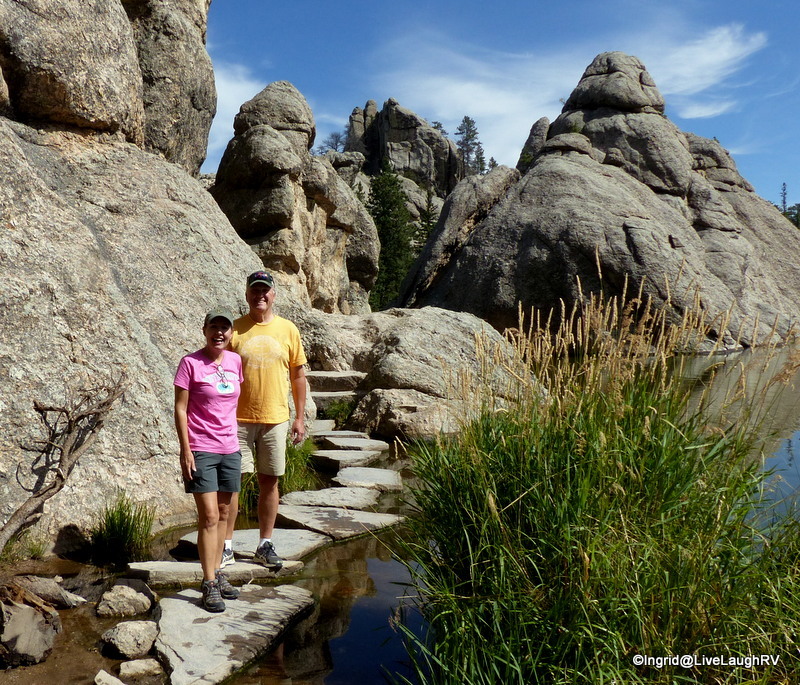 We were intrigued with the granite rock and boulders and the clean, clear, cool water. We even rented one of those paddle boats. While my brother and I exercised our legs, my dad sat on the back with a fishing line in the water. Yep, dad brought his fishing gear. Nothing like trolling via sustainable energy; as long as brother’s legs and my legs held up that is. Dad was great in giving directions on where he wanted us to paddle and gave no thought to our weakening leg muscles. On my recent trip to Illinois, dad and I shared some laughs as we reminisced about this trip. After giving hubby the tour of Sylvan Lake and sharing some of my childhood memories with him, I had one more memorable item on my list that I had to show him for Al to fully comprehend. 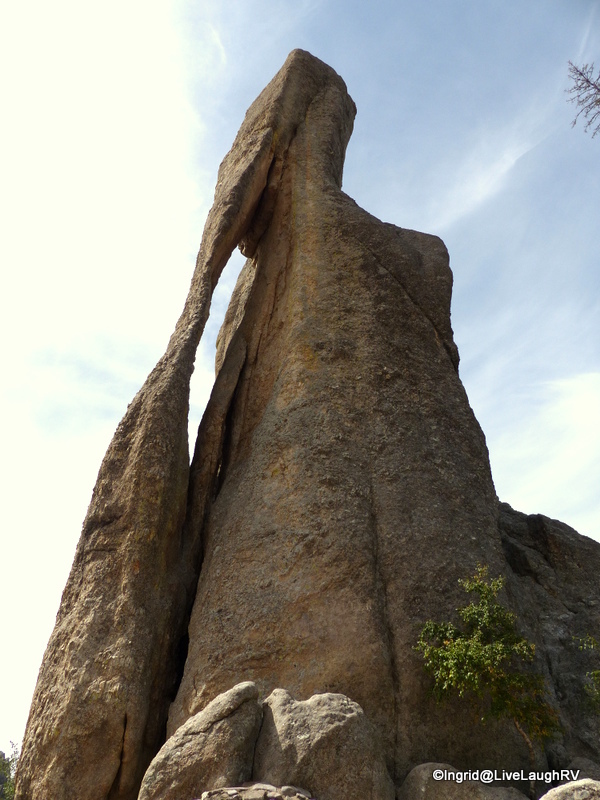 We ventured over to scenic Needles Highway; named after the needle-like granite formation located just past Sylvan Lake. There are two one-lane tunnels along this stretch of road. Tunnel #5 is 8 feet 4 inches wide and 12 feet high. My dad drove his brand new motorhome through this tunnel back in the early 1970’s. I remember my mom begging dad not to go through the tunnel and covering her eyes in fear. As children, we thought dad could do no wrong and found humor in mom’s dramatic behavior. As Al and I waited for on coming traffic to clear the tunnel, we pulled in the side mirrors on the F-250. When it was our turn, I slowly drove through the tunnel all the while I kept repeating, “I can’t believe my dad drove the motorhome through this tunnel”. I now understand why mom freaked out. I asked myself, was dad a skilled driver? Did his sense of adventure push him? Or was he just plain crazy? In dad’s defense I must add, dad did do his homework before driving through this tunnel. He spoke with a ranger. He jotted down all the dimensions on both tunnels and verified the Motorhome’s size. He also discovered a tour bus once a week would travel this route. I guess with that tidbit of information, that sealed the deal for dad and through we went with inches to spare. If a tour bus could fit, so could dad’s motorhome. As Al and I exited the tunnel, we were greeted with stunning views. 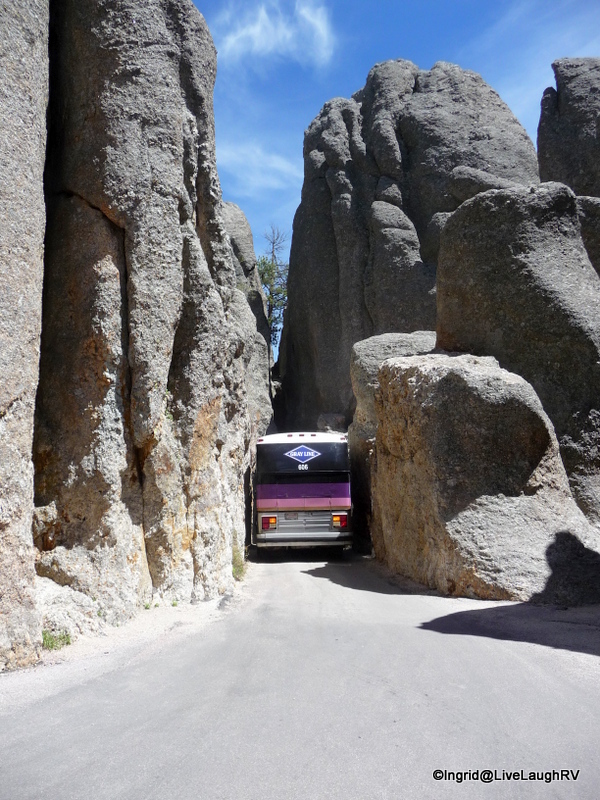 Needles Highway traverses through rugged granite mountains, a diverse forest, and mountain prairie. This is a beautiful drive not to be missed, but a lot less stressful and much more fun in a small vehicle! The next day hubby and I explored Iron Mountain Road. 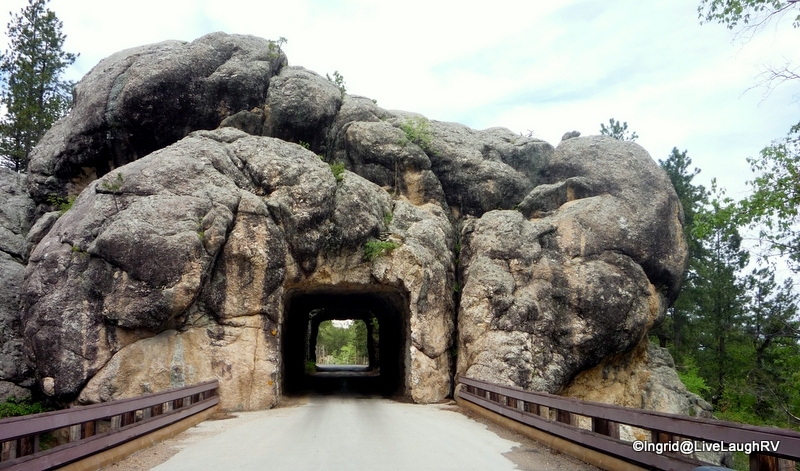 This scenic drive connects Custer State Park and Mount Rushmore National Memorial. 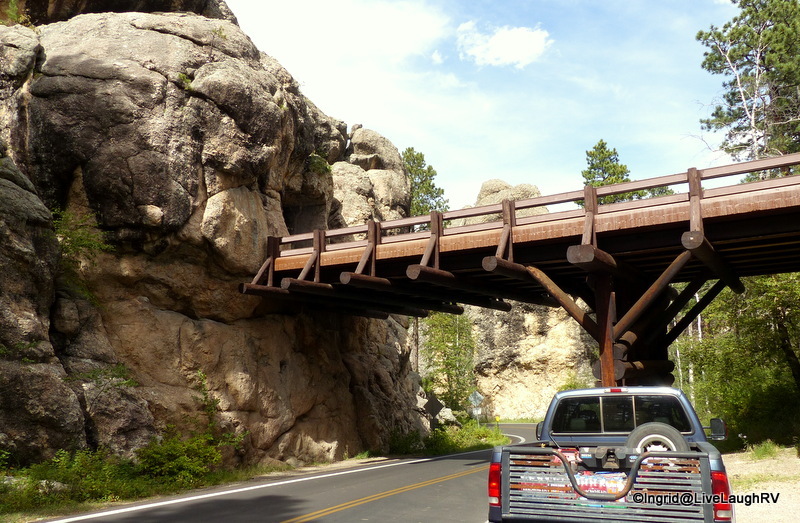 “Experience the road that engineers once said couldn’t be built.” This road was built in the 1930’s and considered an engineering marvel at the time. 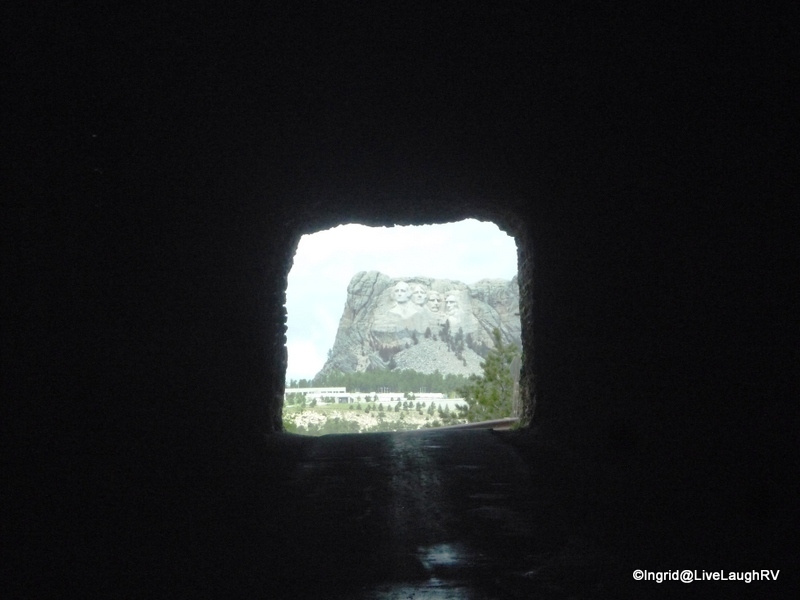 There are three tunnels to pass through and each one frames Mount Rushmore in the distance when entering from Custer State Park. 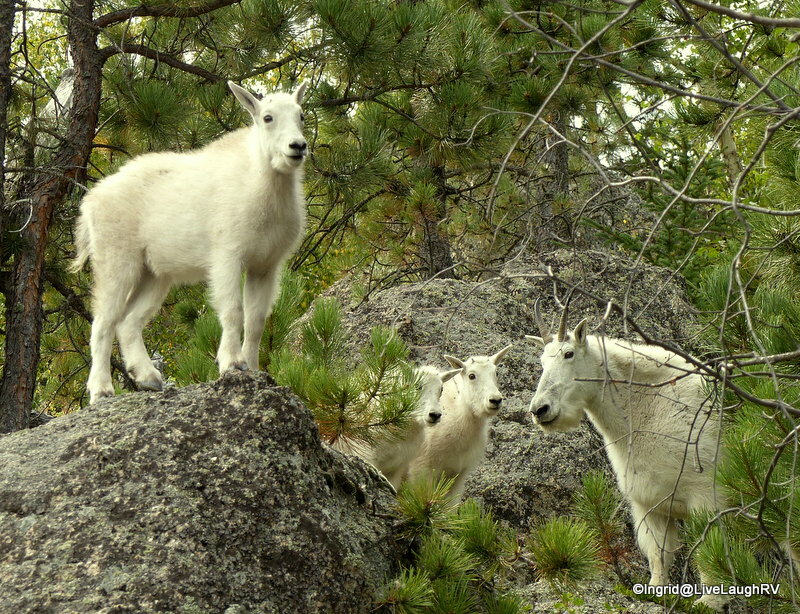 Iron Mountain Road is another very fun and scenic drive not to be missed. 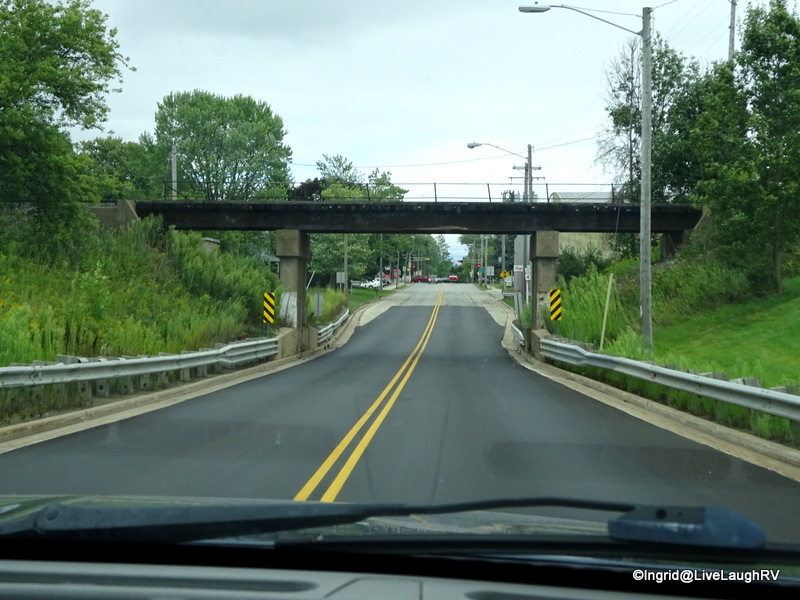 For anyone interested in engineering, construction, or design, this is a captivating road. I loved all the log bridges, the tunnels, and the views. 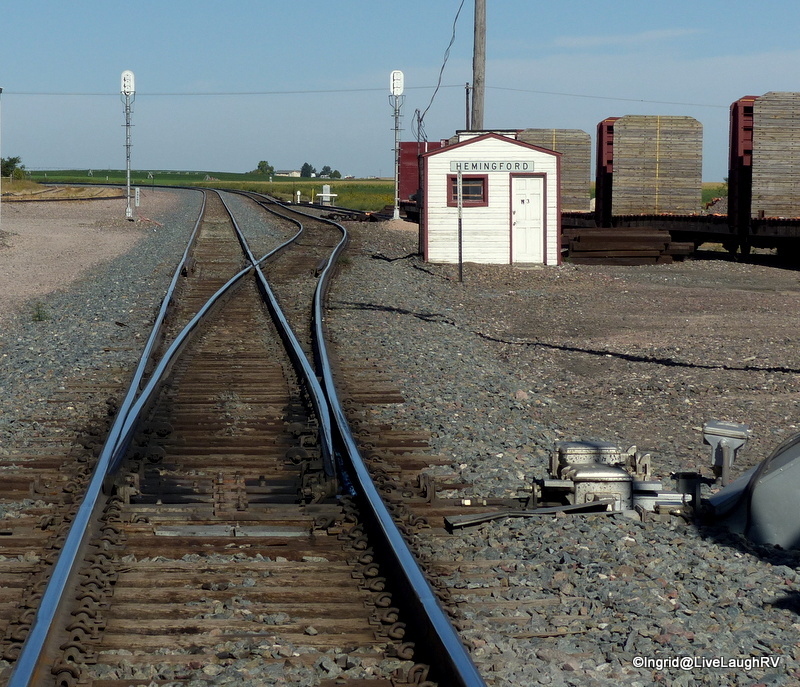 From Mitchell, South Dakota, we continued our westerly trek. 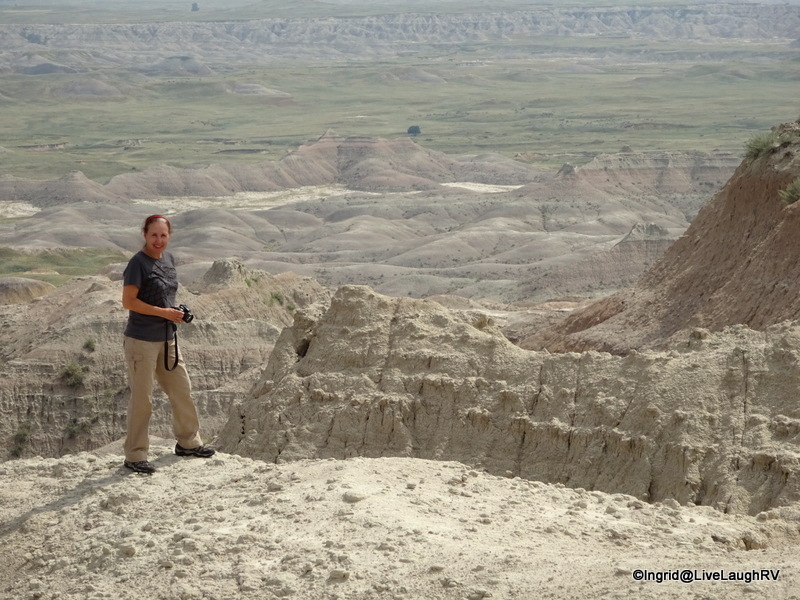 I couldn’t wait to get to Badlands National Park. 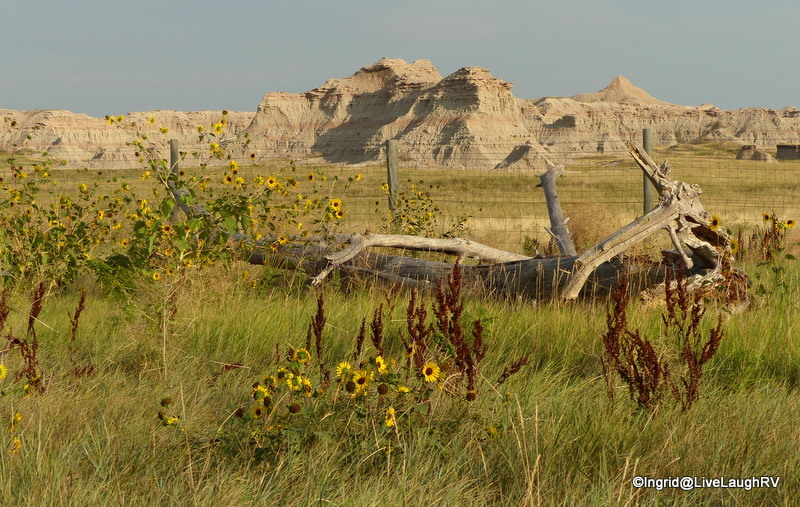 South Dakota’s Badlands holds a special place in my heart. I was a mere 14 years old the first time this gal from Illinois laid eyes on this incredible land. It was the first family excursion in my dad’s new pride and joy; a brand new motorhome. 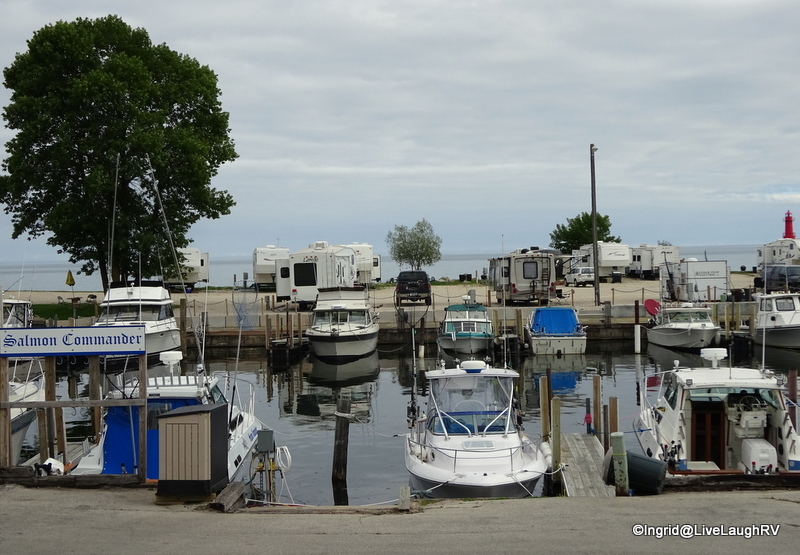 That was an exciting adventure for our family of five, because this was a trip that didn’t entail fishing in Wisconsin, my dad’s favorite pastime. Family vacations ALWAYS centered around camping near fishing action. No fishing involved during this trip! My brother was eighteen at the time and getting ready to head off to college. Dad put him in charge of navigating, which was a much better choice than my mother, who could get turned around in the blink of an eye; directionally challenged one might say. While the guys were up front driving and navigating my little sister, mom, and myself sat at the dinette table taking in the sights out of the motorhome’s big windows. The barren, rugged land made mom quite uncomfortable. While the rest of us were oohing and aahing, she sat in silence. You see, mom and dad grew up in Germany, even my brother was born in Germany and this kind of vast desolation doesn’t exist in her homeland. This was like nothing she’d ever seen before and it made her feel uneasy. 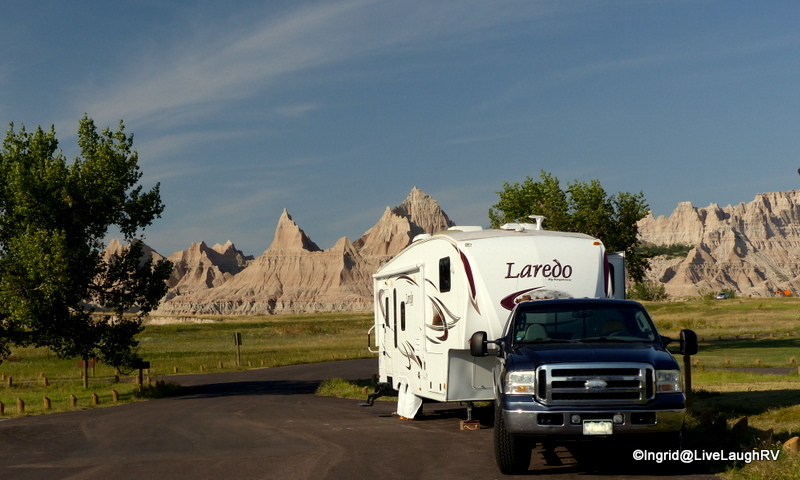 We stopped at various pull-outs and scenic overlooks before it was time to decide where to camp for the night. Dad was definitely feeling adventurous during this trip and decided to take the twelve mile rutted and rough gravel-dirt road to the primitive campground. It wasn’t a campground, but merely a designated parcel of land allowing overnight camping. I don’t even remember there being a pit toilet, just raw open land. Ah yes, this is what us RVer’s now refer to as boondocking. This was definitely not mom’s idea of a relaxing vacation and I remember her freaking out as my brother and I took off exploring. 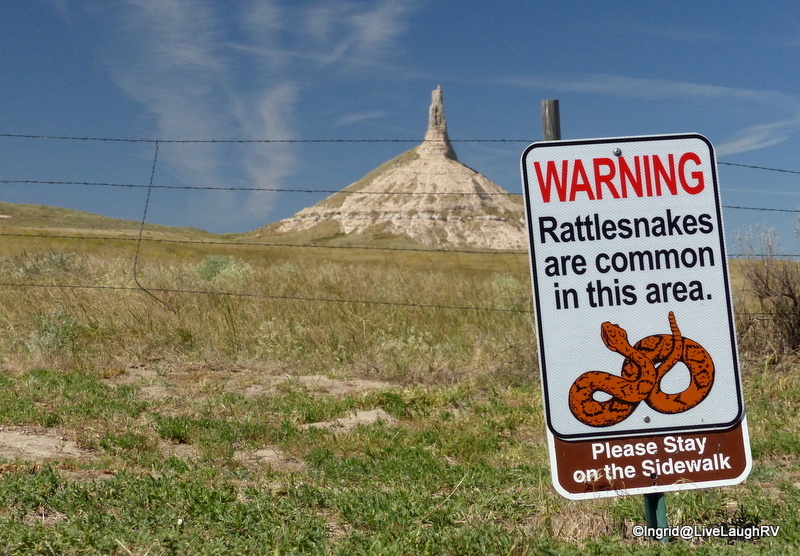 I wanted to see buffalo and maybe even a rattlesnake. 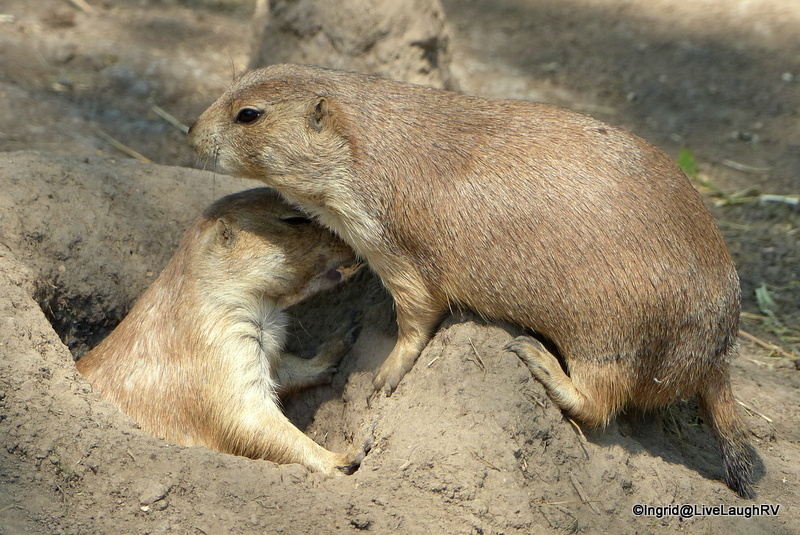 I saw neither during that trip but wasn’t disappointed because the adorable Prairie Dogs captivated my attention. So here I am, umpteen years later and oohing and aahing every bit as much, if not more, as I did years ago. 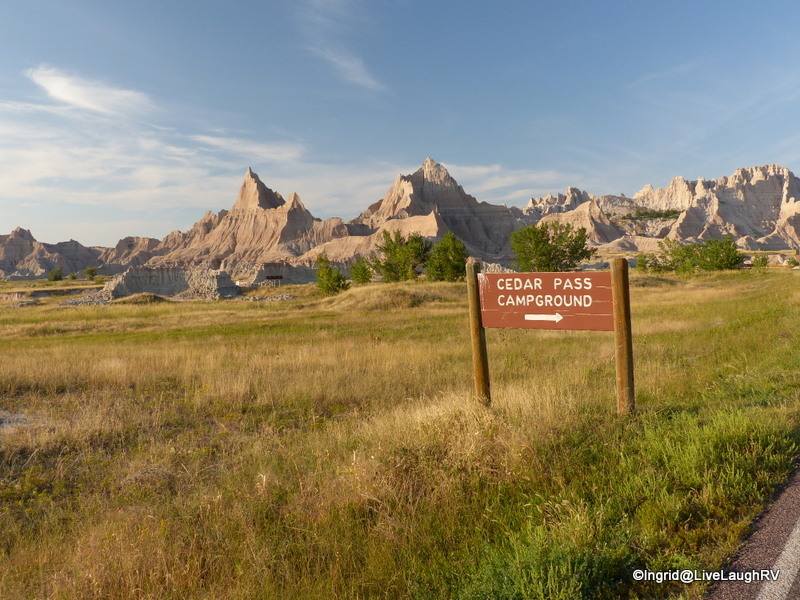 I really wanted to camp at that same primitive campground from the family trip, but with temperatures in the 90 degree plus range, we opted to stay at the Cedar Pass Campground with electric hook-up so we could run our air-conditioning during the heat of the day. 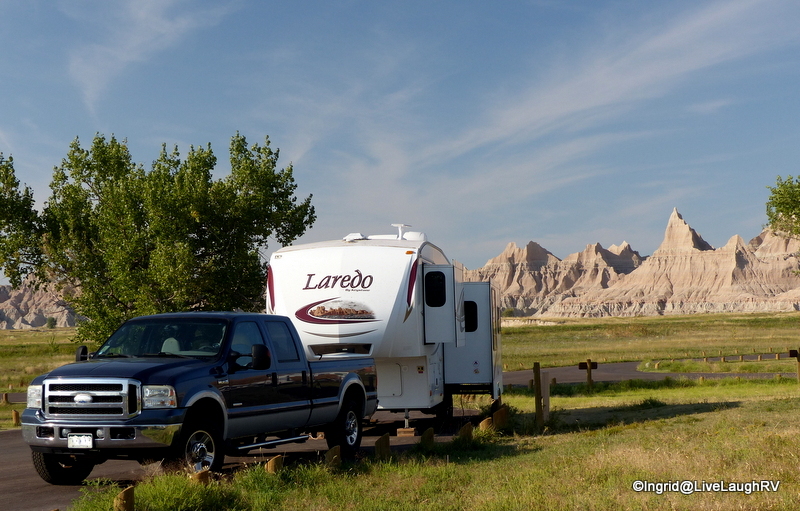 However, a trip to the primitive Sage Creek Campground was in order. I had to refresh my memory. 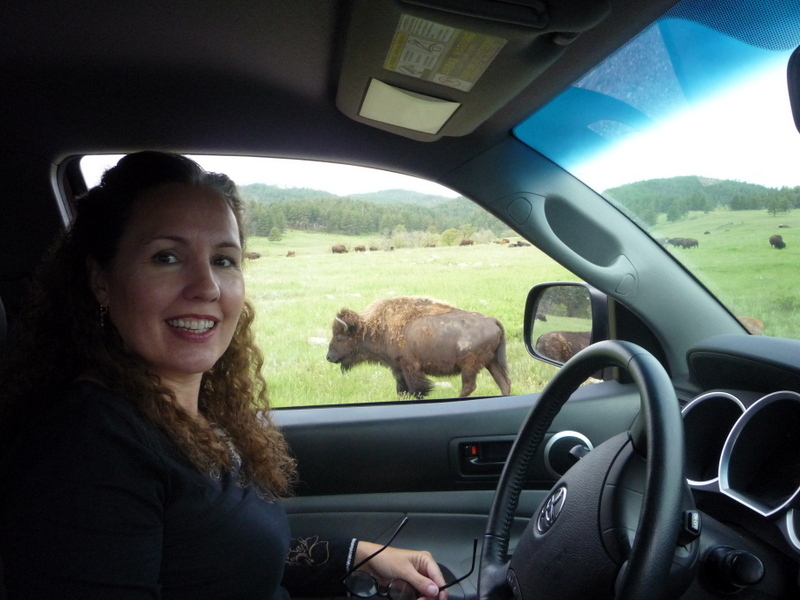 Unlike my last visit, this time I saw plenty of buffalo aka bison. We turned off the main paved road onto a well maintained gravel road. The road was in much better condition than all those years ago. We continued the twelve miles down the road passing herds of buffalo in the distance. The sky was hazy with smoke drifting down from the Pacific Northwest wildfires. Not only was the road very well maintained, the campground turned out to be a little more developed than all those years ago. 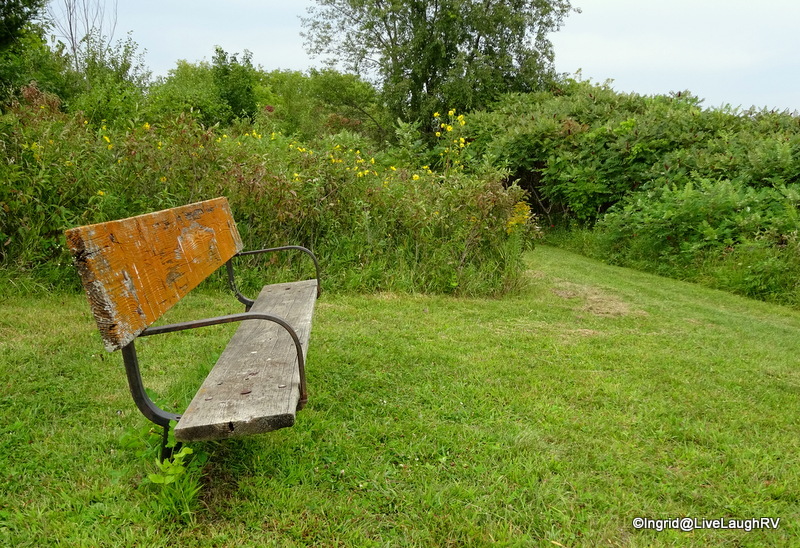 There were picnic tables and pit toilets…. no water. 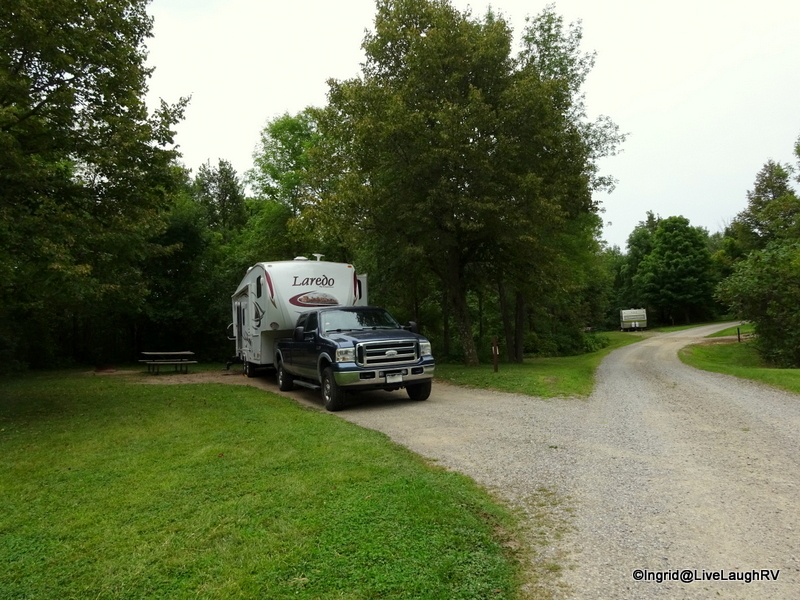 The campground is used predominantly by tents, but is also accessible to RV’s. 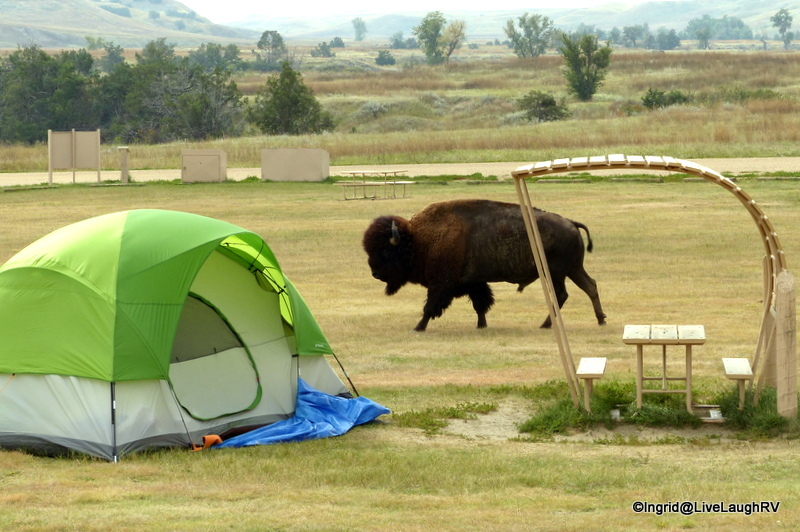 Bison routinely meander through this campground causing a need to watch where you step…. 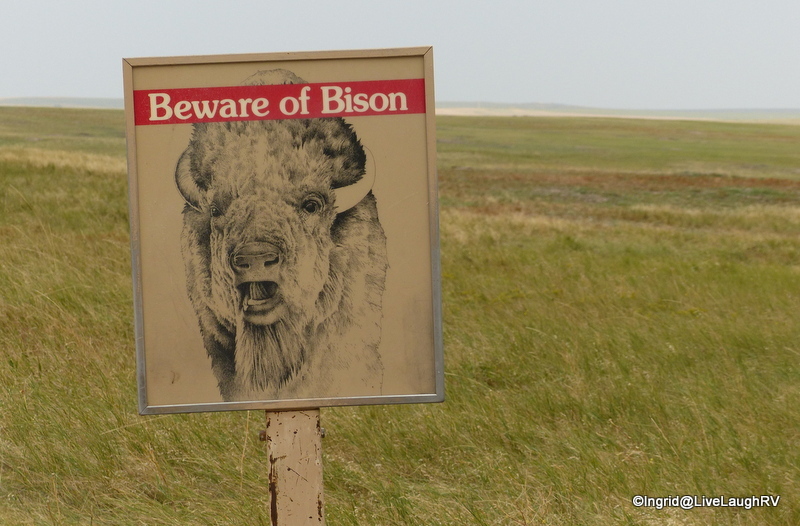 fresh Bison droppings wouldn’t be fun to step in. 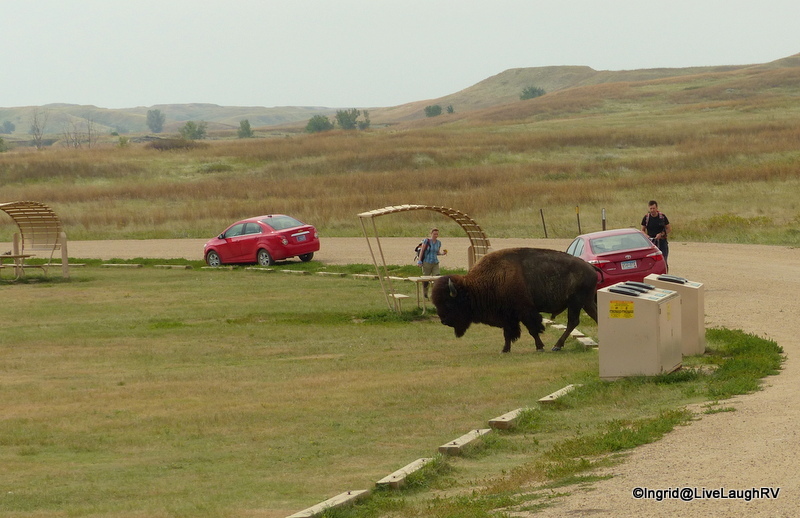 The cars give perspective showing how large Bison are. 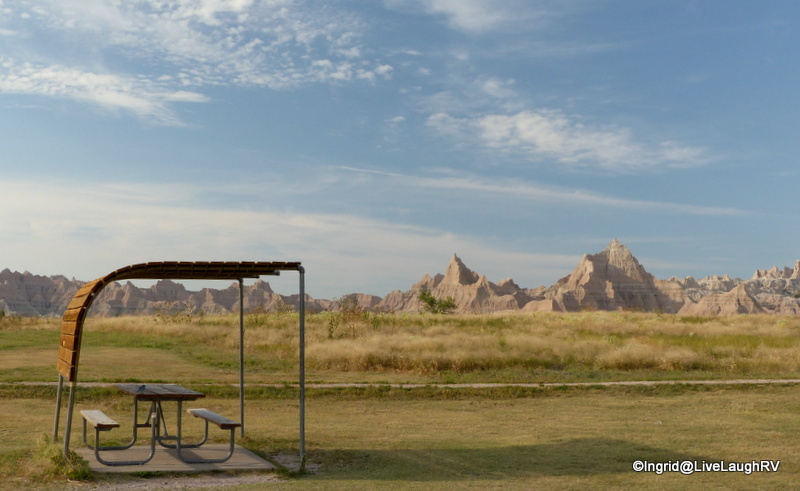 I assure you, on our next visit to the Badlands National Park we WILL definitely be staying at this campground. 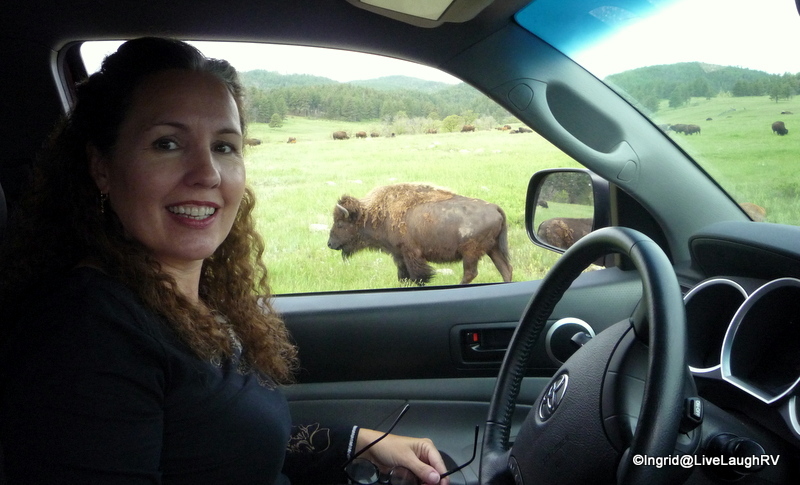 I’ll admit though, I did have an uneasy moment with one Buffalo. I was sitting in the truck taking his photograph when he started to approach me; heading straight toward me and the driver’s side door. 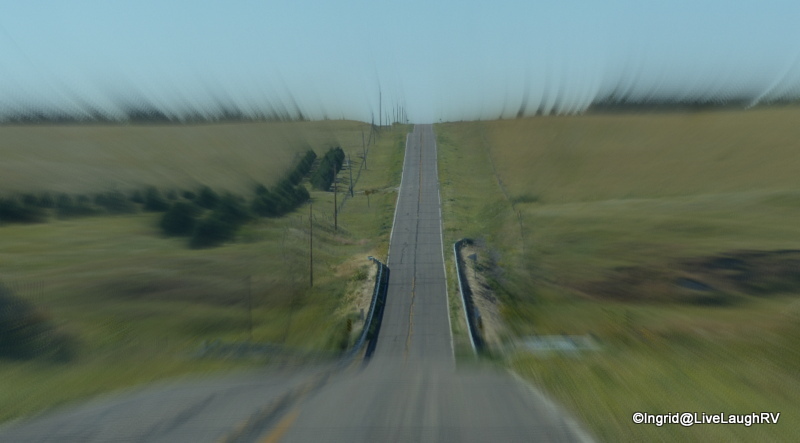 As his pace quickened in my direction, I dropped my camera and put the truck in drive, not waiting around to see what his intentions, if any, were. Perhaps we made eye contact a little longer than he liked or perhaps he just wanted me to scratch behind his ears horns. Didn’t matter, I was outta there! 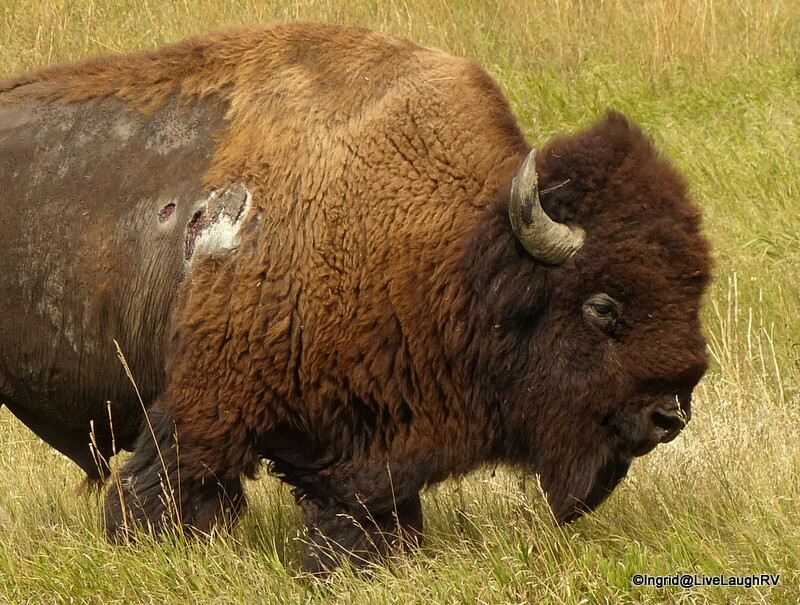 Bison have been known to attack, so ample distance, a wide berth, and good judgment should always be heeded. Check out the wounds on this guy! 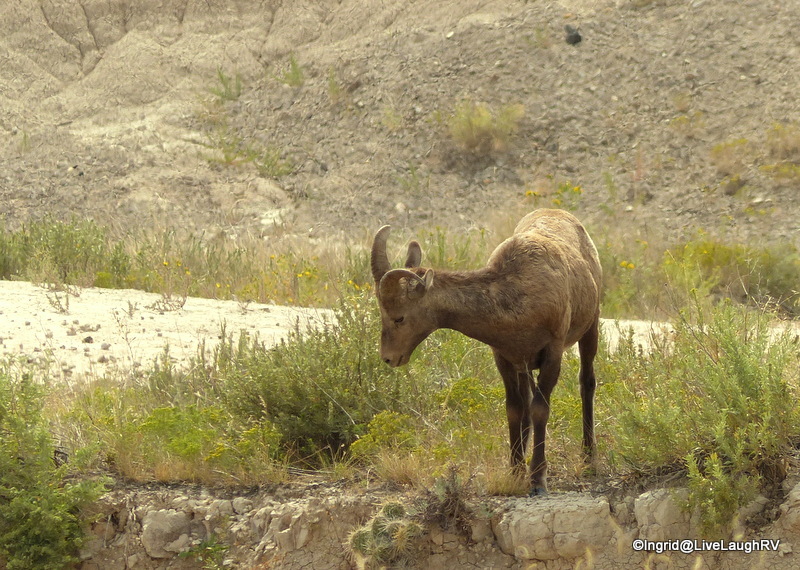 After my fun moment of reminiscing and communing with buffalo, we continued on the scenic drive to the town of Wall, located near the Badlands National Park western entrance. This is definitely a tourist attraction complete with plenty of souvenir and T-shirt shops. 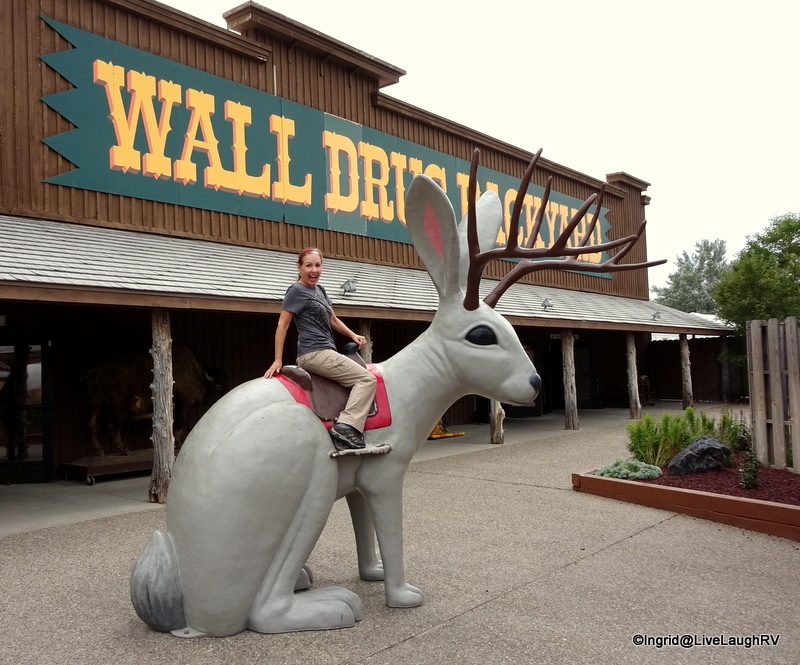 Wall Drug is the focus of this tourist draw and although Al and I usually shy away from such venues, we found ourselves entertained. The story of the Hustead family is one of tenacity and the pioneer spirit. You can read their fascinating story here. We were also surprised to find a place where you can still get a cup of coffee for 5¢. Granted, we’re not talking designer coffee (aka Starbucks), but for a nickel it was a tasty cup of Joe. 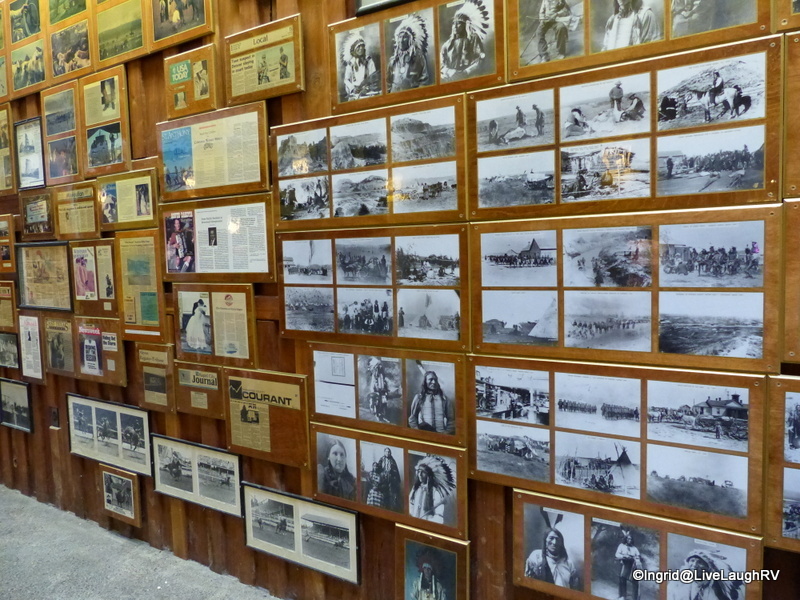 The corridors at Wall Drug were filled with old photos and newspaper clippings. History buff hubby loved it and even non history buff me, found it enlightening and interesting. Three T-shirts later (yeah, I have a thing for T-shirts), we headed back to camp. 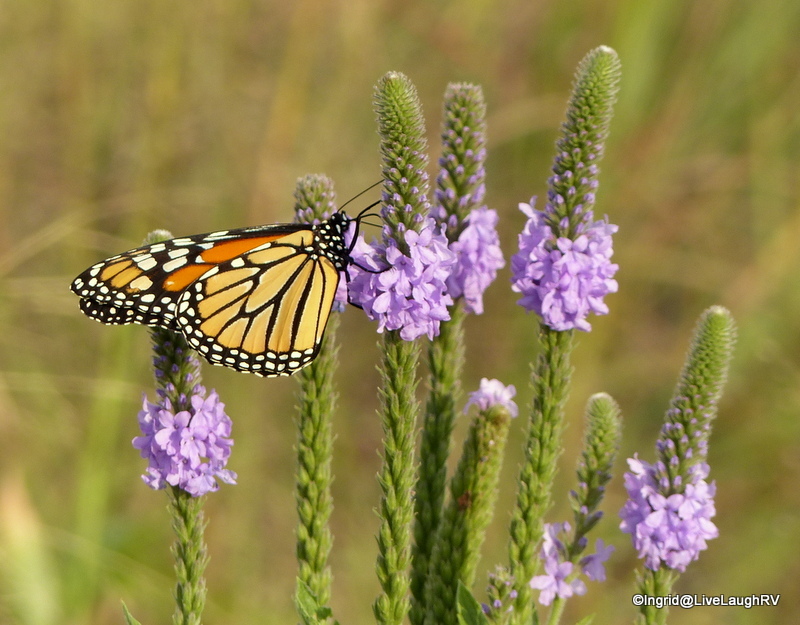 I spent the next couple of days close to camp observing natures beauty. 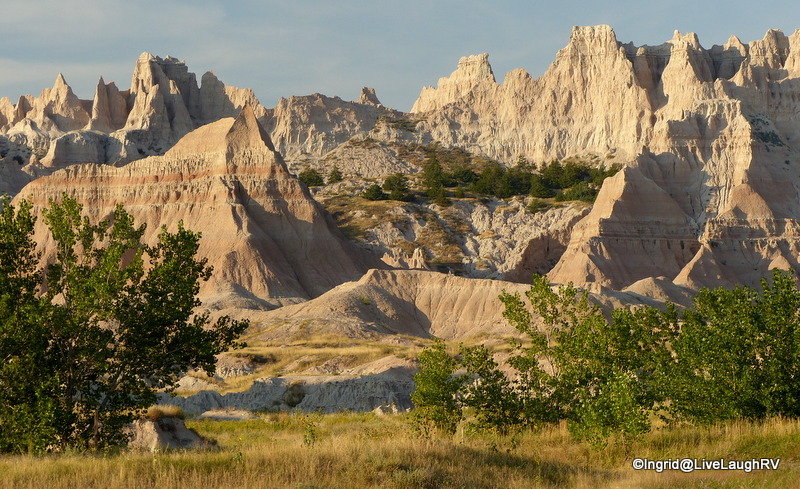 Upon first glance, the buttes, spires, and pinnacles of this steeply eroded land may look desolate. 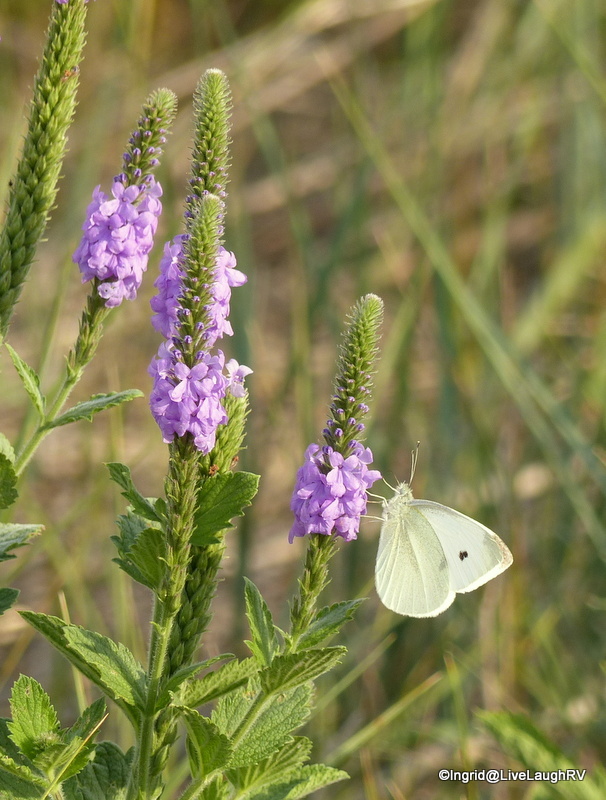 But if one looks closely, diverse and beautiful signs of life can be discovered. 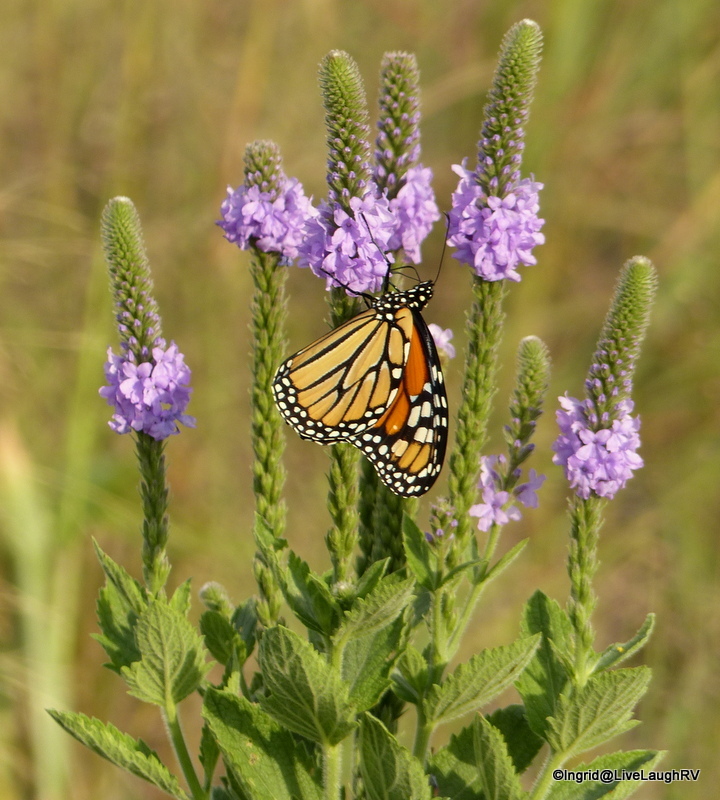 There’s an abundance of rich and varied vegetation, including one of the largest mixed-grass prairies in the country. And then there’s the bountiful wildlife. A watchful eye and a silent slow pace will reward onlookers. This land of extremes, evokes a sense of mystery. 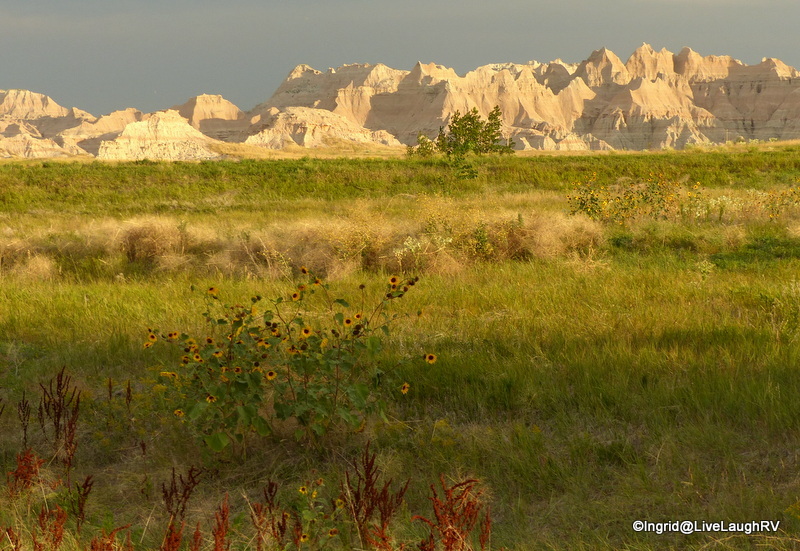 While living in my RV surrounded by the Badlands, I immersed myself in this surreal landscape. 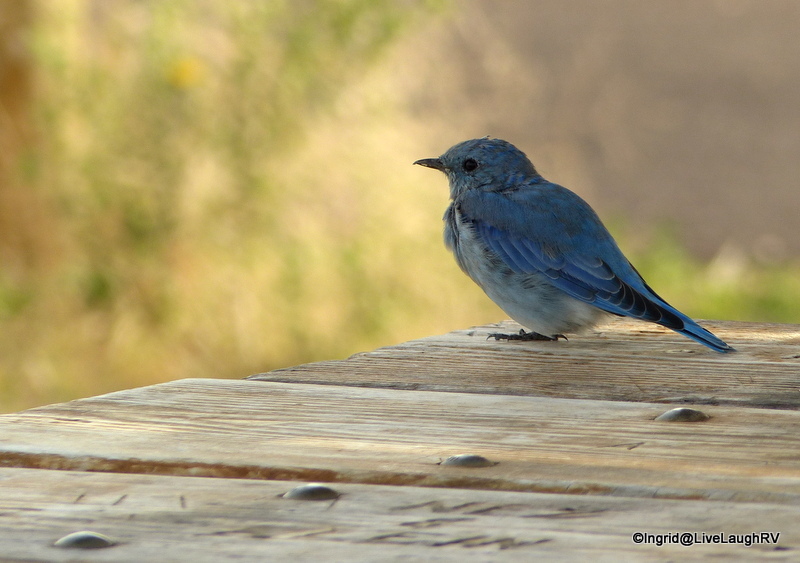 I share the amazing scenery with my friend perched on the picnic table. 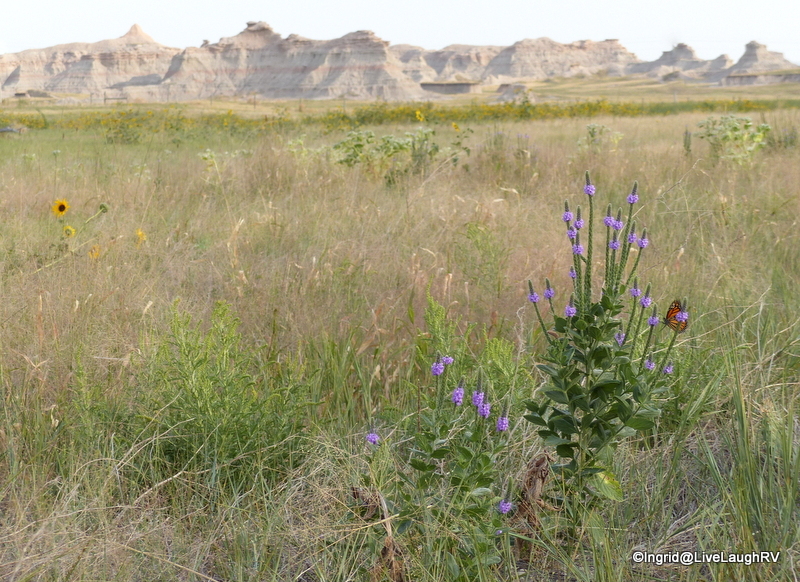 The weather can be extreme but when approached with a preparedness, the Badlands can offer an endless supply of pleasure and fascination. 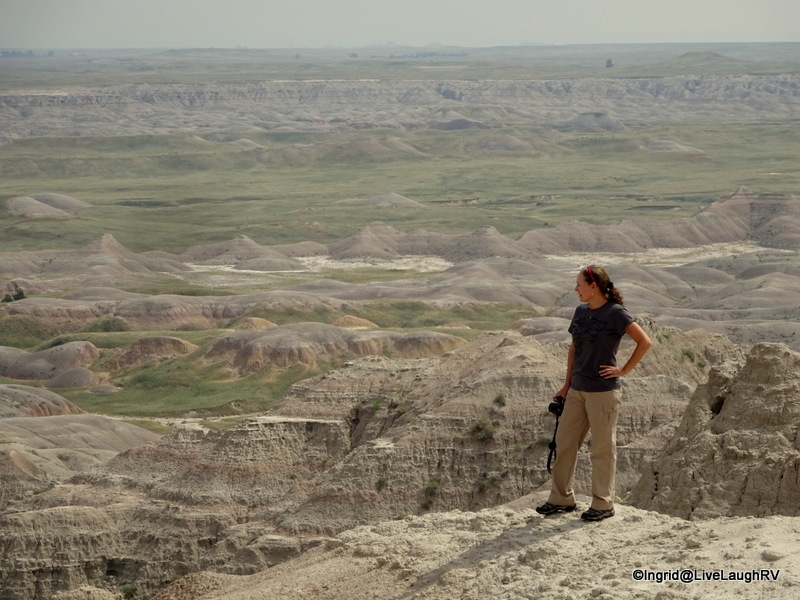 Due to the smoke-filled, hazy skies and extreme heat during our visit, our explorations at Badlands National Park may have been minimal, but the visit was equally as memorable and special as my childhood experience. Not only does it sound like we’re doing the Two-Step, it feels like we’re doing the Two-Step ….. country dancing across America’s Heartland. 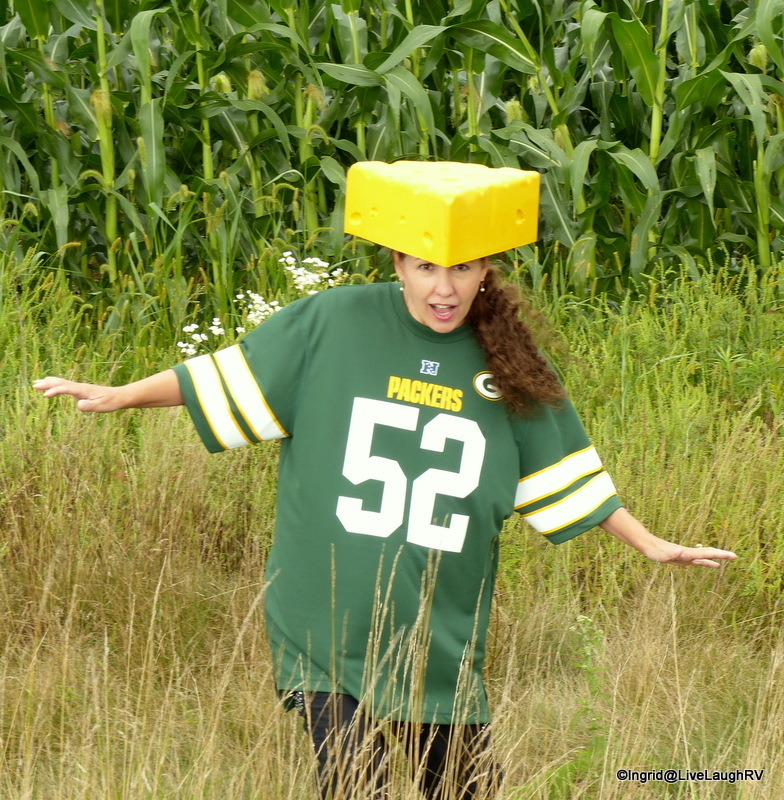 Quick, quick across Wisconsin and Minnesota. 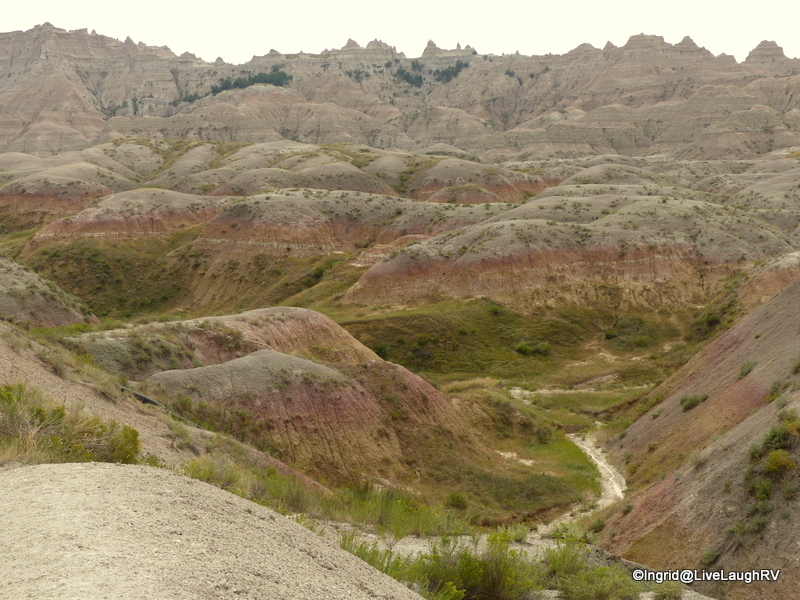 Slow, slow as we explored South Dakota’s Badlands and Black Hills. 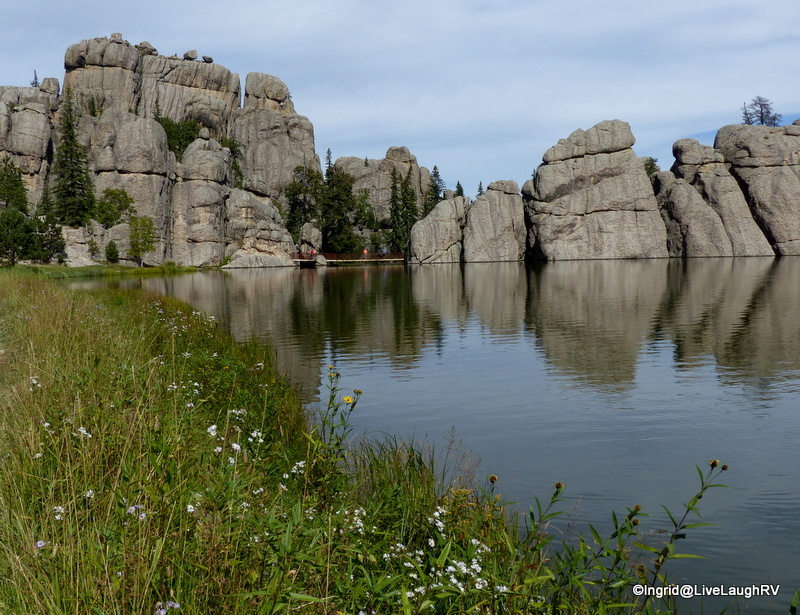 There’s a quiet beauty to Custer State Park with its dense forests, open grasslands, and towering granite. 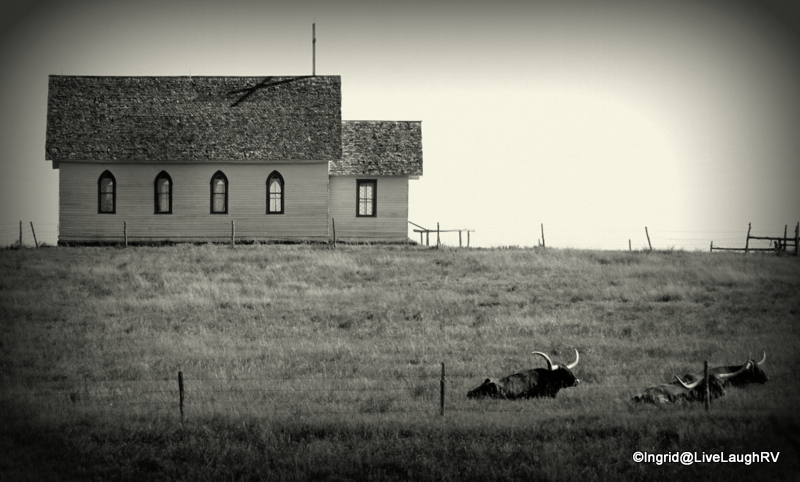 The towns, more like villages, through-out the Black Hills have a laid back charm. 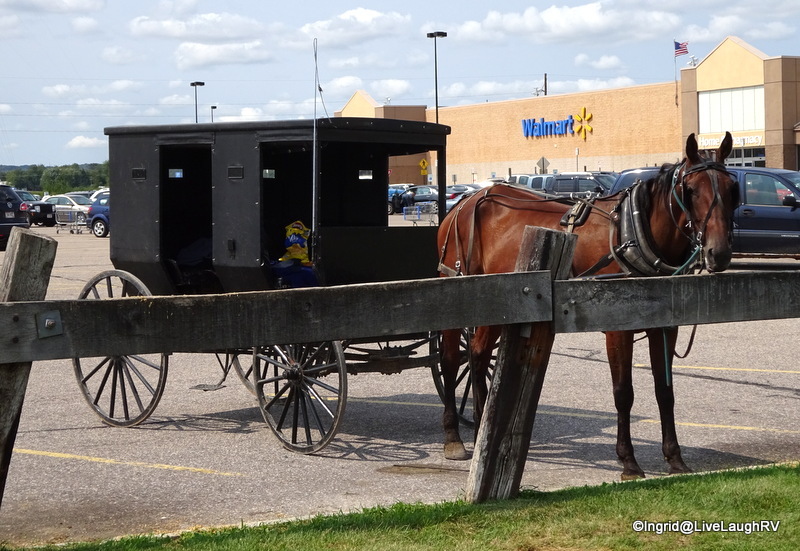 With the exception of Rapid City, you won’t find any chain restaurants or big box stores. 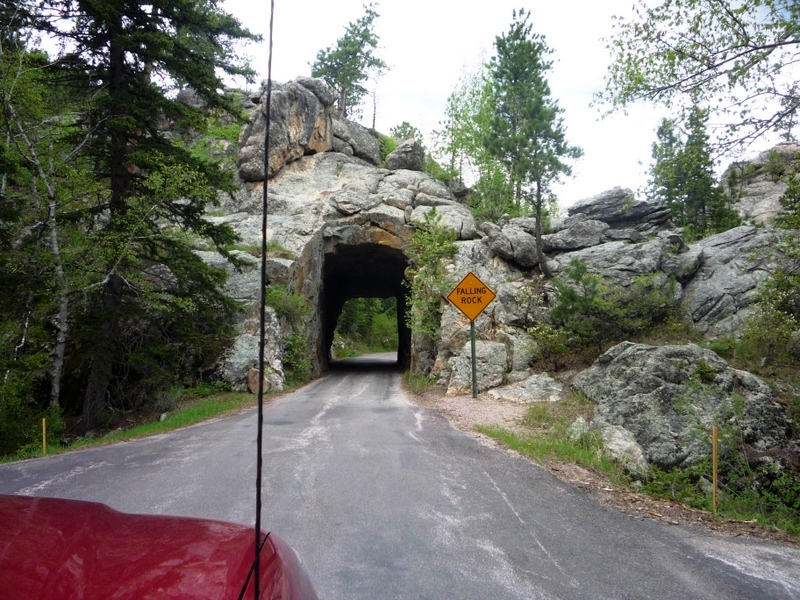 What you will find are plenty of narrow, winding roads with the occasional one lane tunnel (RVer’s beware!) and plenty of wildlife. 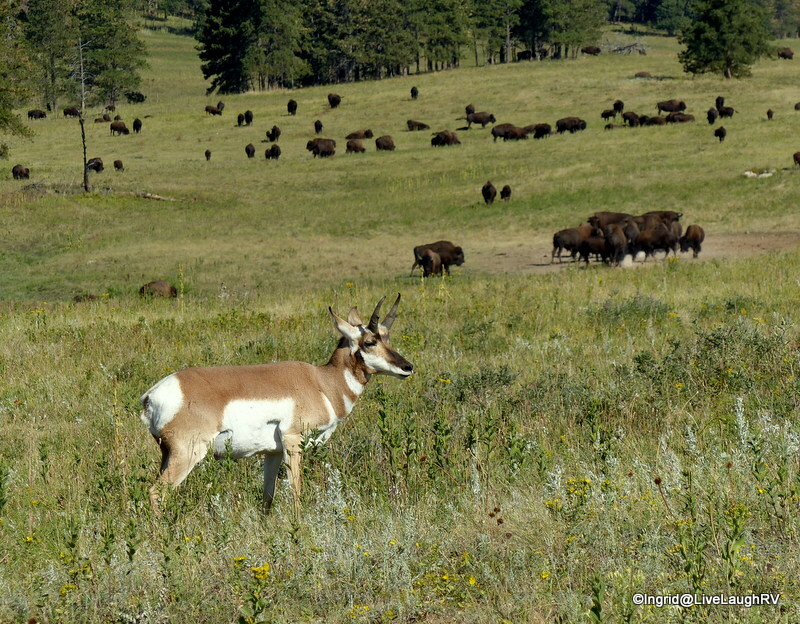 I was successful in my hunt for Buffalo and today I’ll be in search of Pronghorn, or more aptly called Antelope. Colorado is heavily populated with Antelope and it’s not unusual for me to see a herd while traveling Interstate 25. However, I have never had the right opportunity to photograph an Antelope. Thus today will be the day….I hope anyway. Daughter and I get off to an early start. That is an early start to a college student, a late start in my book. It’s about nine in the morning and we’ll take Wildlife Loop Road again. Since we’re familiar with the area, we now know where we plan to focus our efforts. 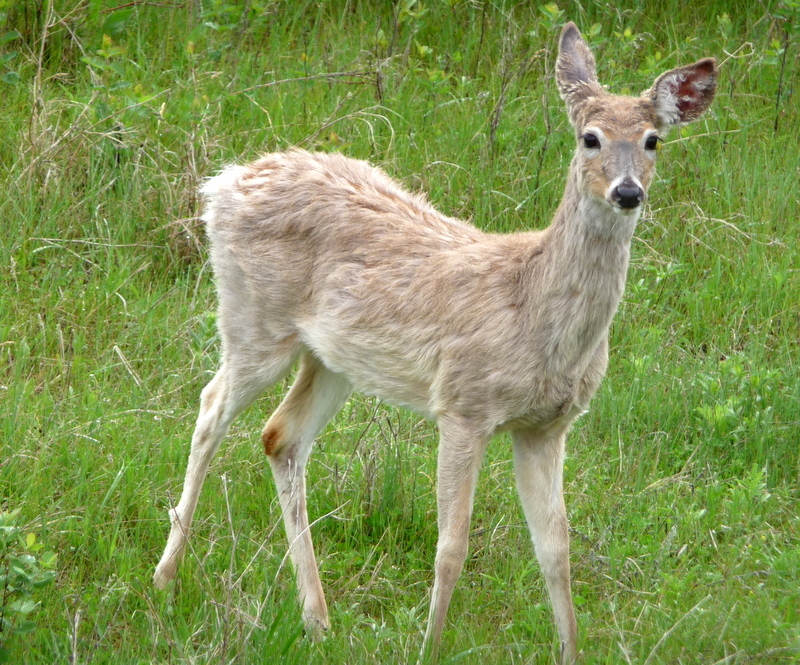 It isn’t long after turning onto Wildlife Loop Road that we come upon some deer. How cute is this little guy? 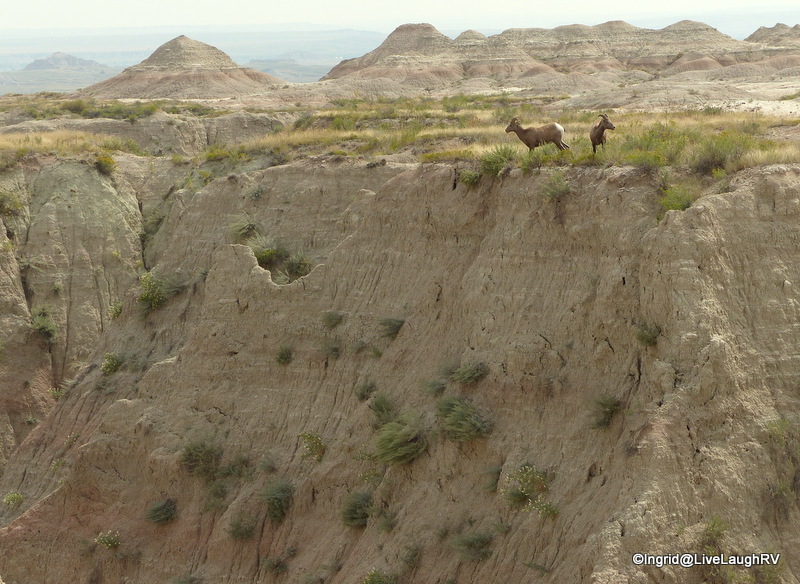 We continue heading south and shortly after, we notice some Antelope. We find a place to pull off the road and now it’s photo-op time. 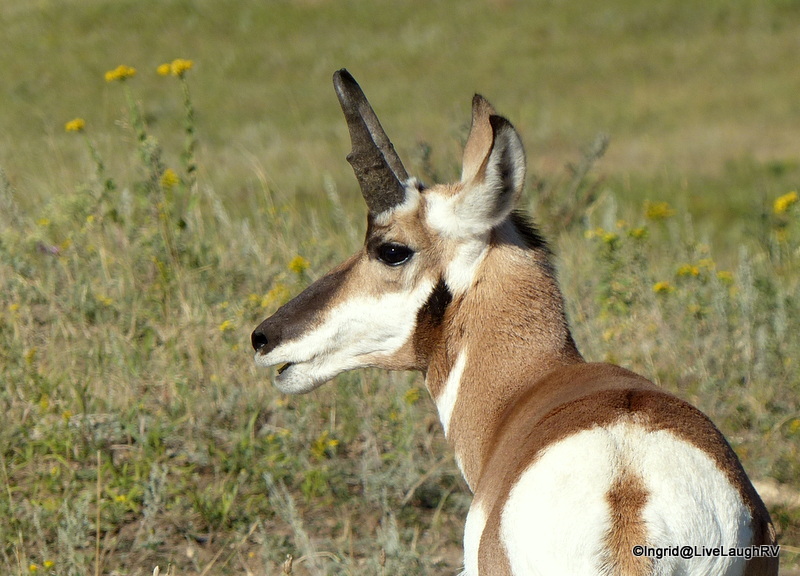 Normally Antelope are very skittish, but these guys allow me to get unusually close. 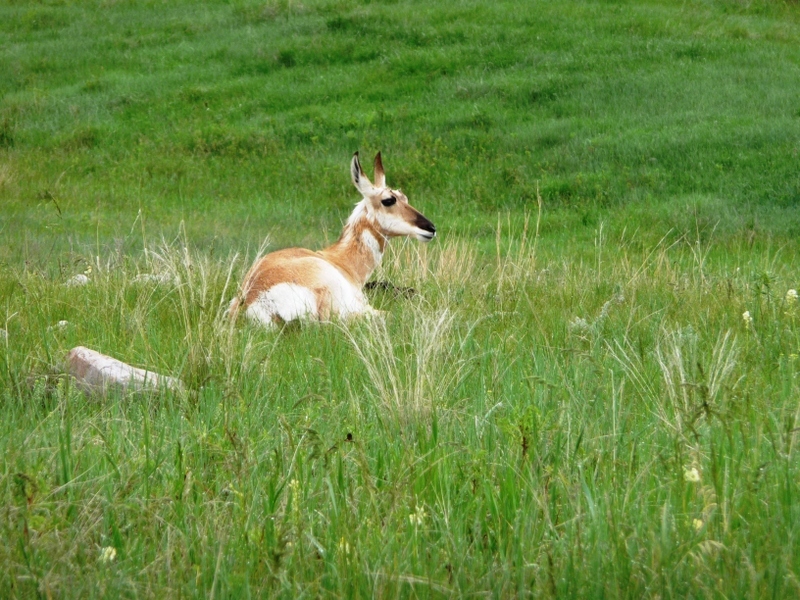 Antelope are one of the fastest mammals in the Western Hemisphere. They can run as fast as 60 mph. Antelope are poor jumpers and therefore they won’t jump fences. 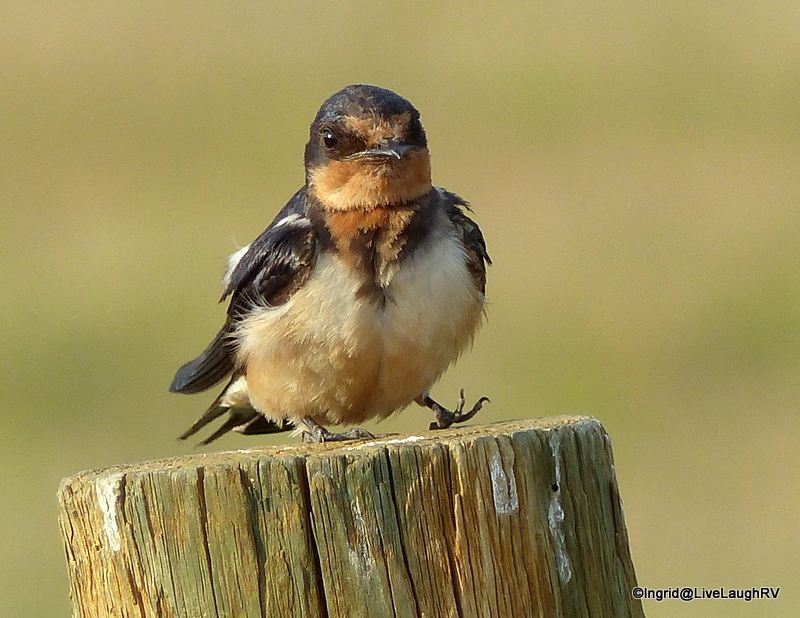 They live primarily in grasslands, and can be routinely seen in Wyoming, Colorado, South Dakota, and New Mexico. I find these guys fascinating and am pried away by a bored daughter. How do we top this day? 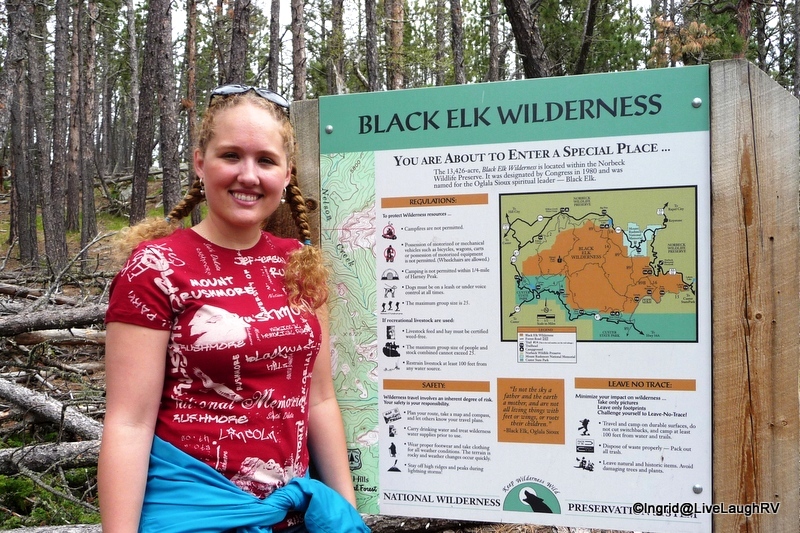 A couple of years ago, my daughter and I went on a road trip to the Black Hills in South Dakota. 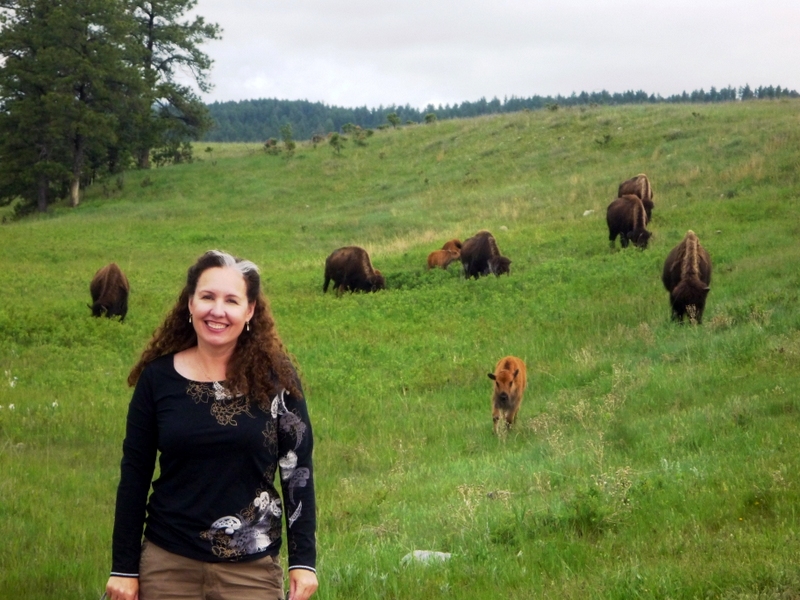 My main goal and objective was to see the herd of free ranging buffalo. I guess the proper term is Bison (Latin) but the name Buffalo (Europeans title) is more commonly used. According to all the info I read published by Custer State Park either term appears to be acceptable. 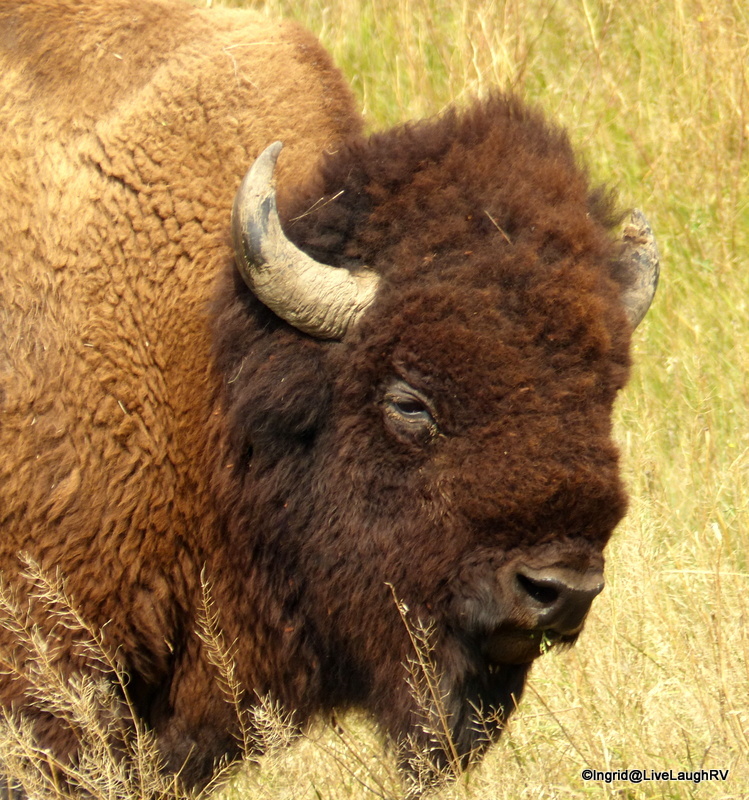 Custer State Park is home to almost 1500 head of Buffalo. 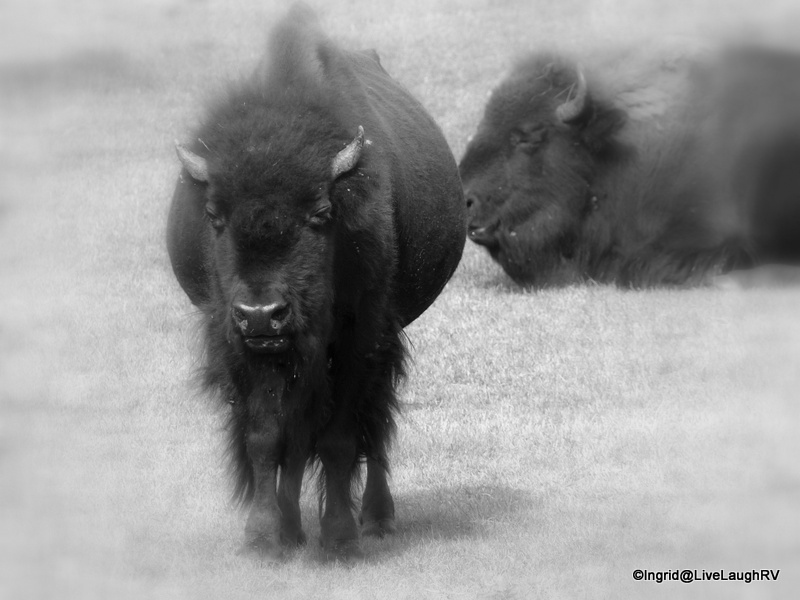 Each September the Park has a Buffalo Roundup, available for visitors to view. Park staff and volunteers will have up to 60 horseback riders and 20 trucks aiding in the round-up. 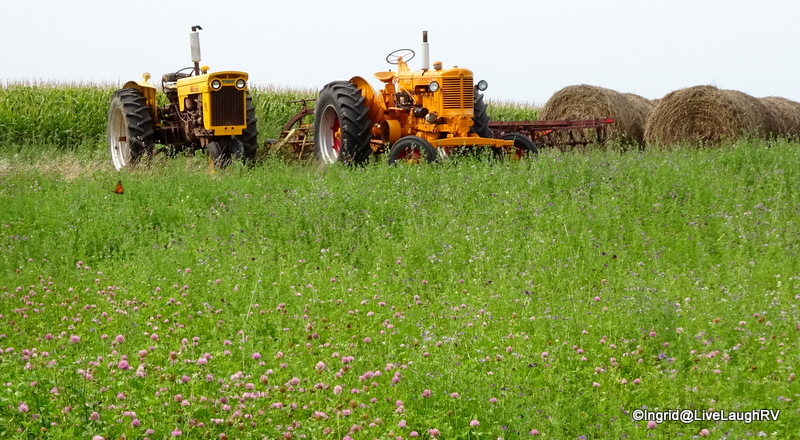 This yearly round-up is important in the control and health of the herd. 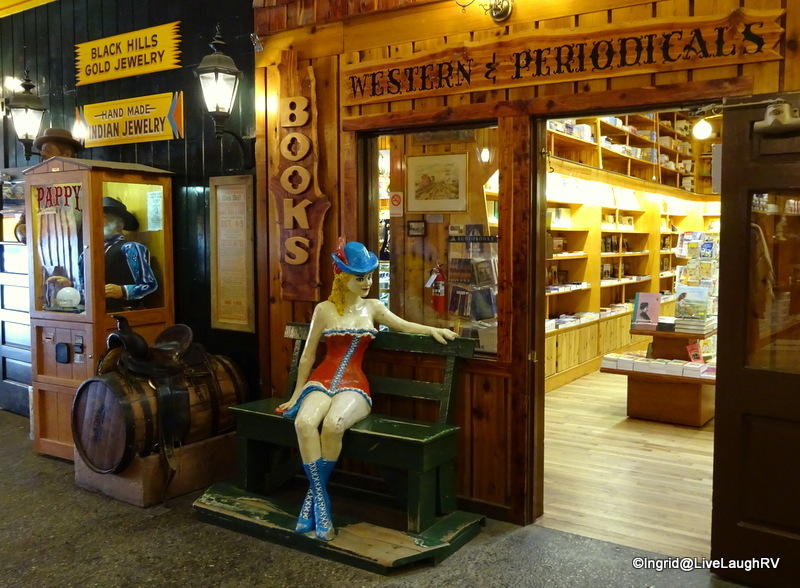 Round-up; note to self for a future visit. I was not disappointed in our quest to find a herd. It did take some exploration though. 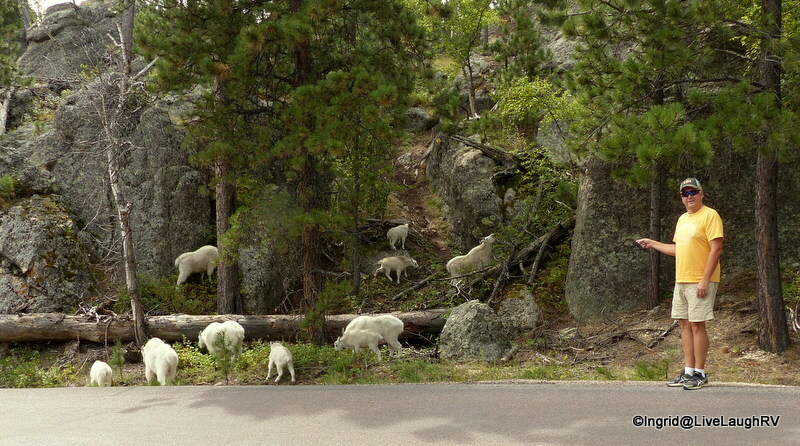 We found a herd while driving Wildlife Loop Road. 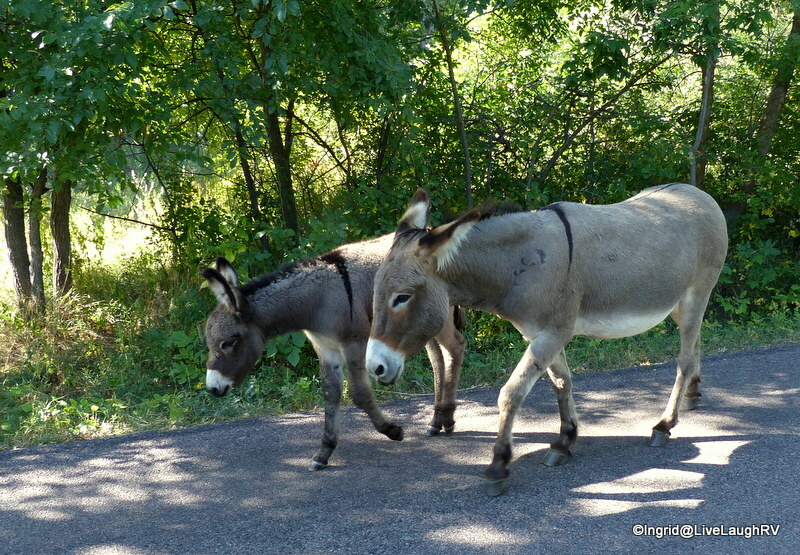 However, our first wildlife encounter were Burros. 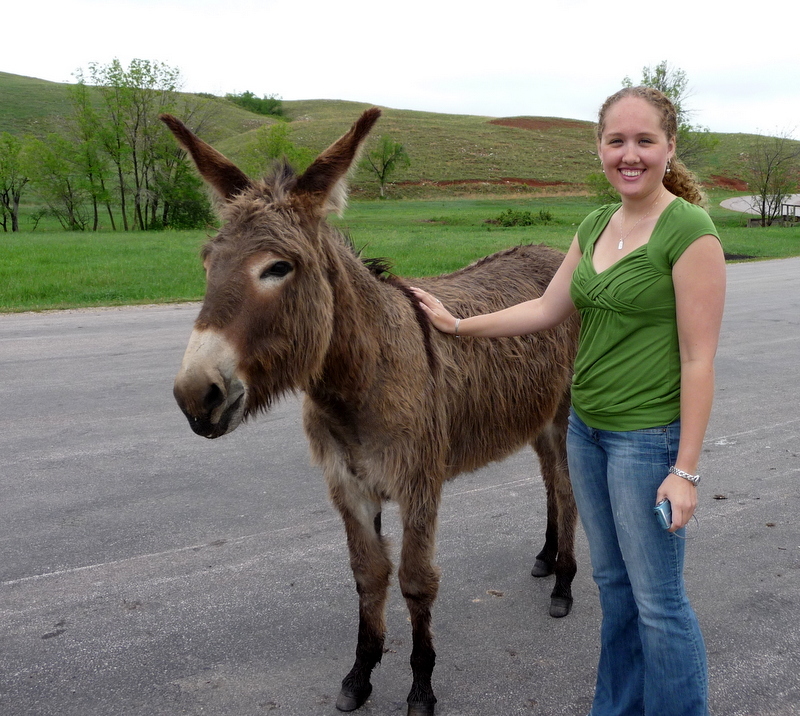 There is a herd of Burros that wander the park, and although considered wild, they are accustomed to people. Caution and common sense are prudent when approaching these animals. 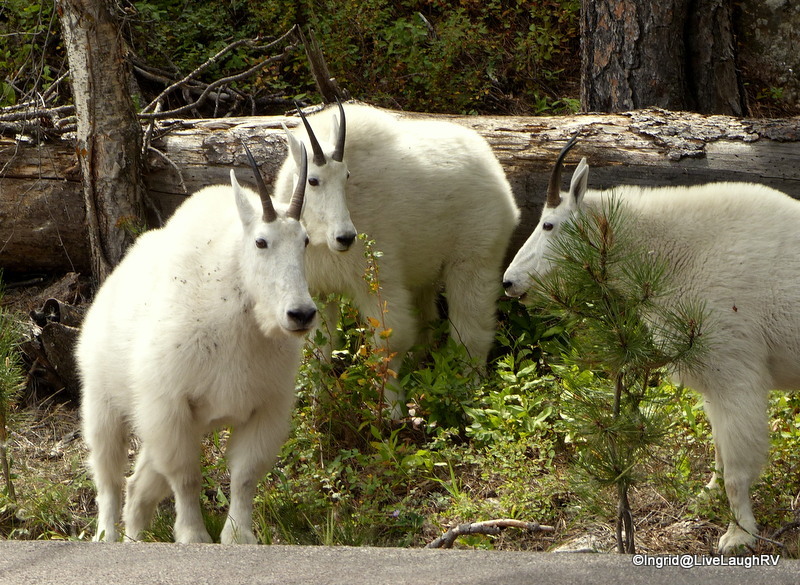 The Wildlife Loop Road is an eighteen mile paved scenic drive with numerous gravel roads off shooting in different directions. We did venture down a couple of these gravel roads in search of buffalo. The first herd we encountered were pretty far off in the distance. 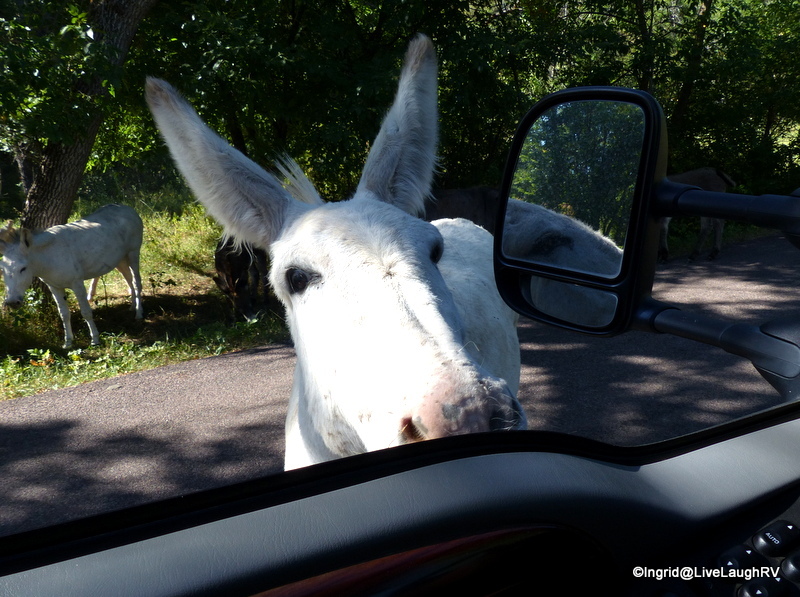 So, back to the paved road and thirty minutes later, we met a herd on the side of the road…..awesome. We spend a good half hour observing these large animals. My daughter gets concerned as this calf starts to approach me. Where there’s a baby, there’s a mama. A quick photo-op and I return to the vehicle. These guys are huge. The bulls can weigh as much as a ton while the cows come in at 900-1200 pounds. New born calves are about 50 pounds…ouch! 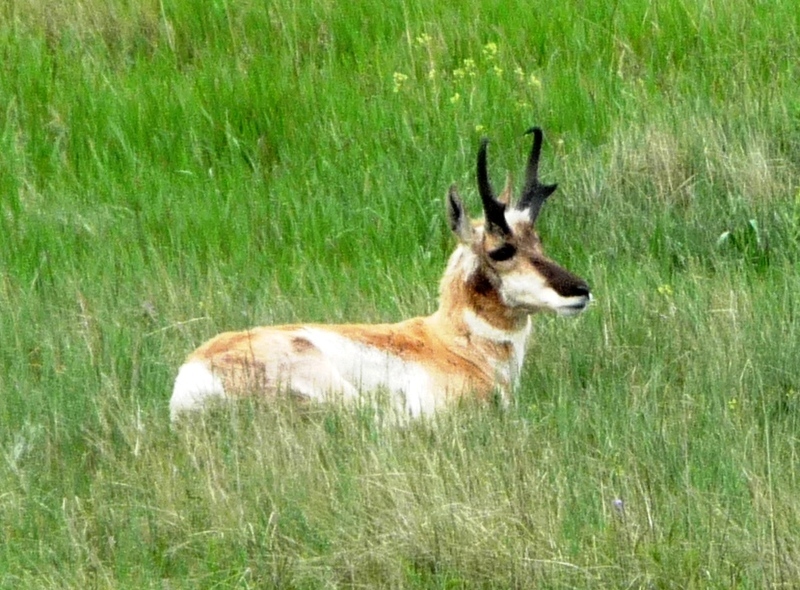 Tomorrow we’ll be in search of Pronghorns…..